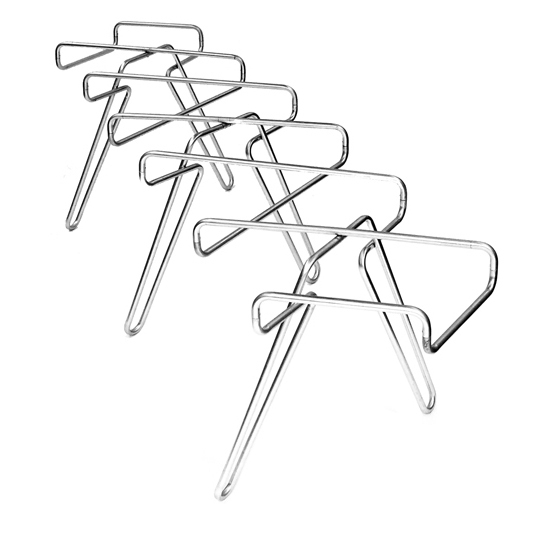 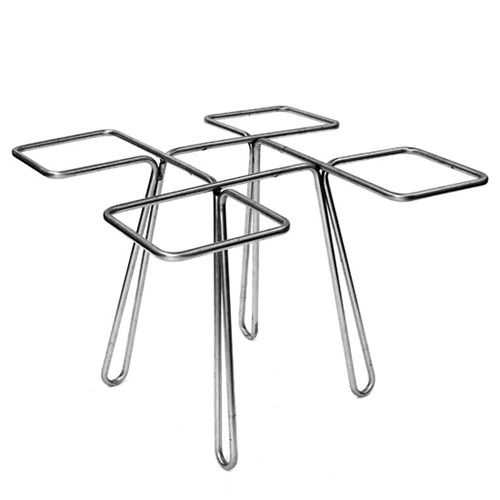 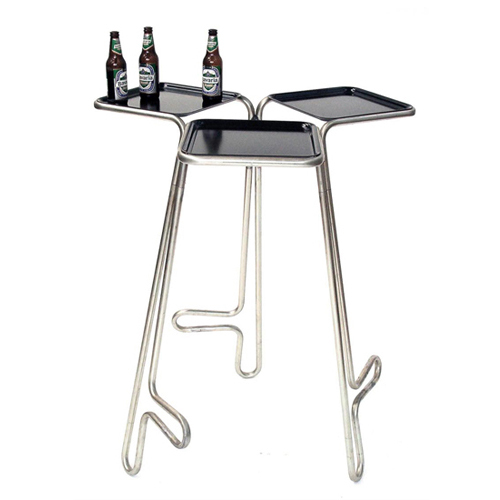 i’m a fan of multi-functional furniture; if a product can successfully fulfill more than one task, it has more reasons to exist. 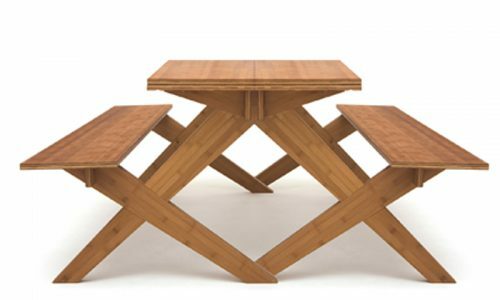 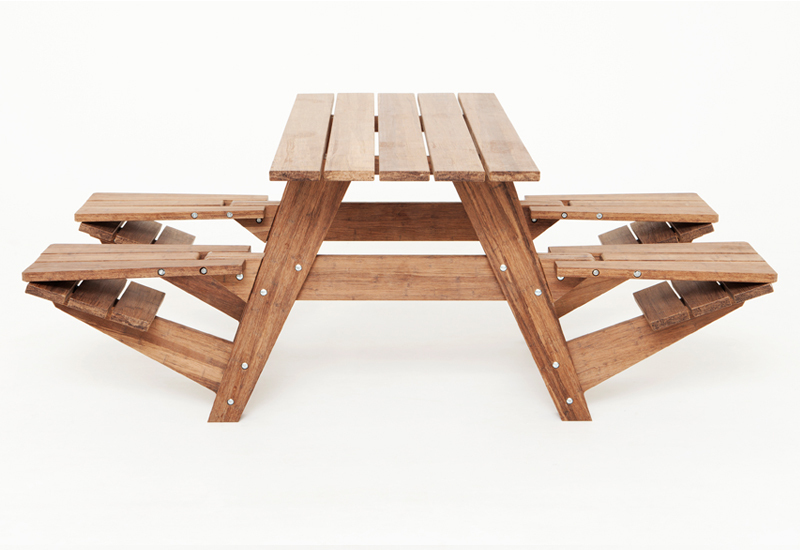 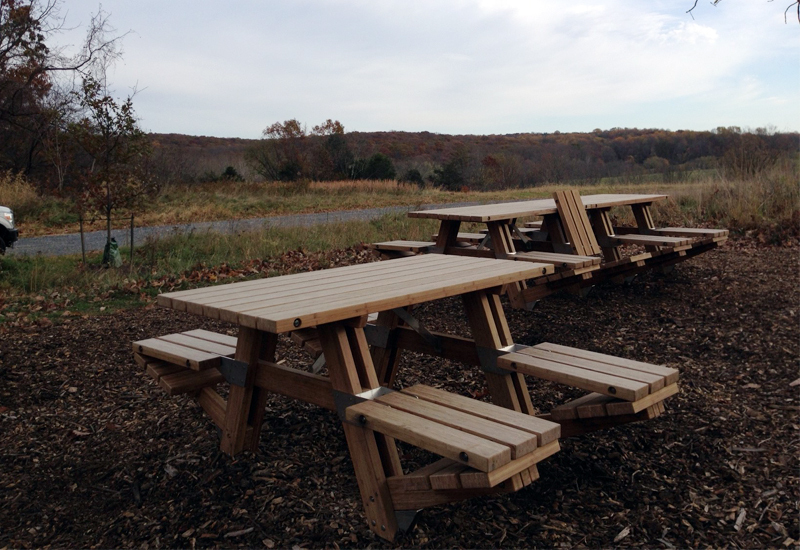 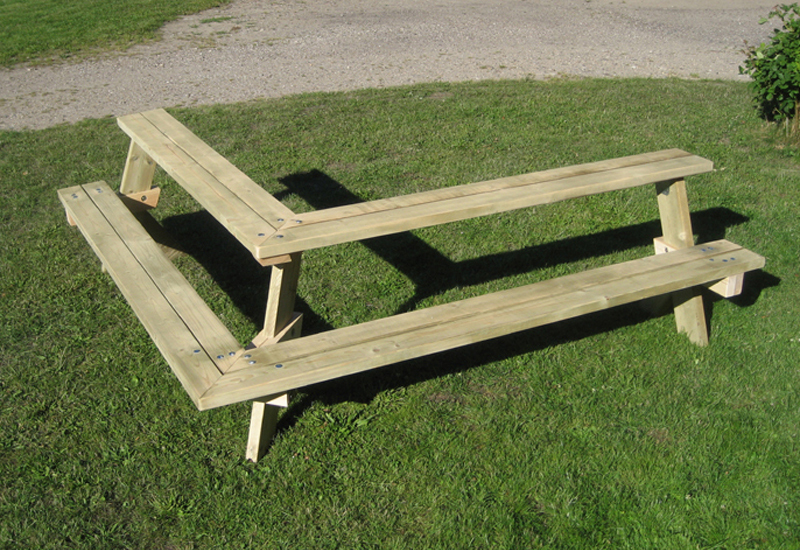 even though the iconic picnic table is a perfectly balanced piece of outdoor furniture, it is large, massive and therefore rather immobile. 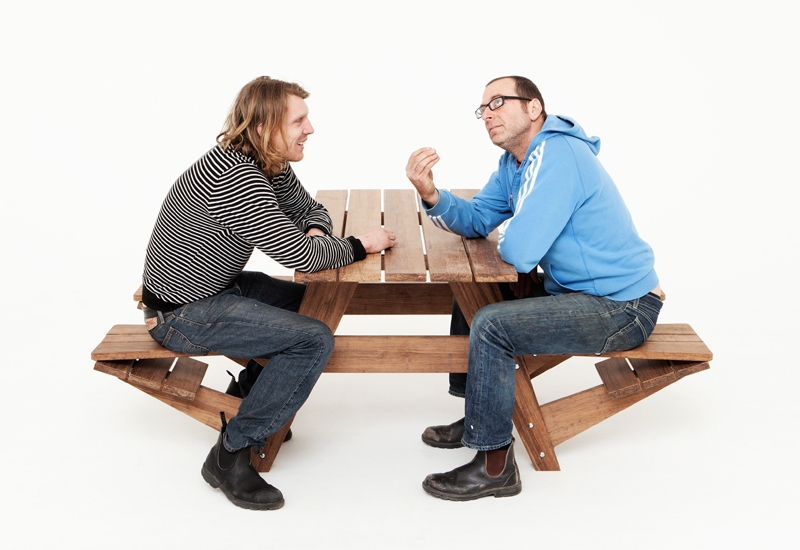 it also offers only one option – to sit face to face. 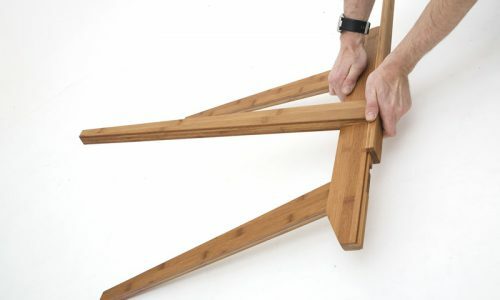 by slicing it in half and bending one edge, a new object has emerged, one that can be used in various ways. 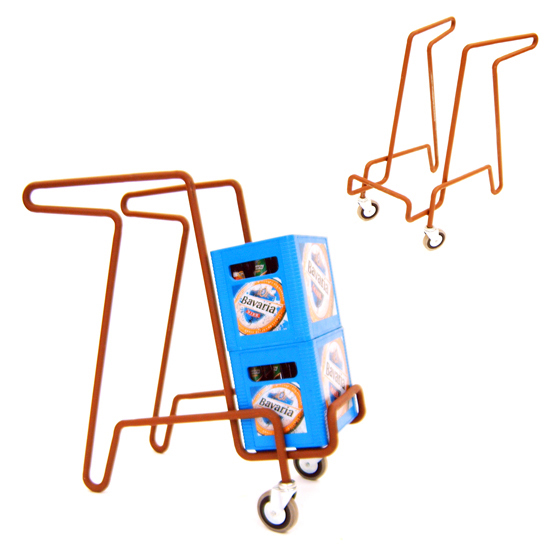 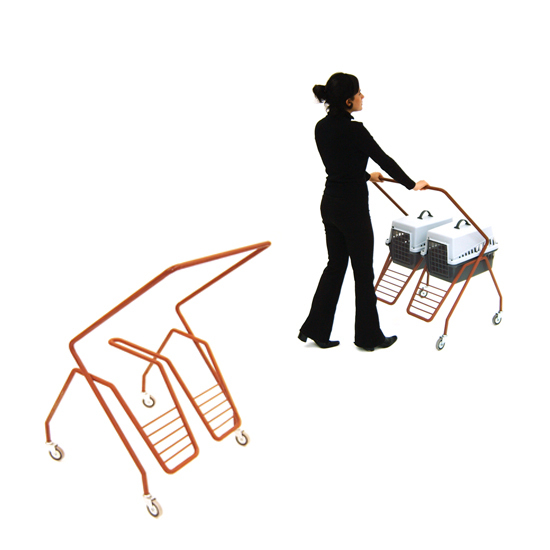 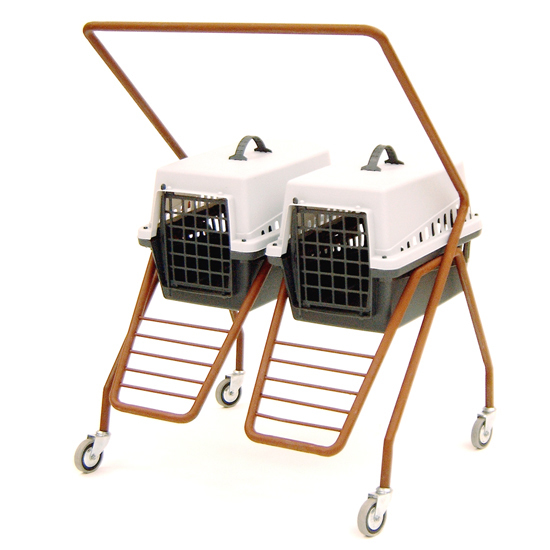 it is easy to move around and if you have a couple, surprising configurations are possible. 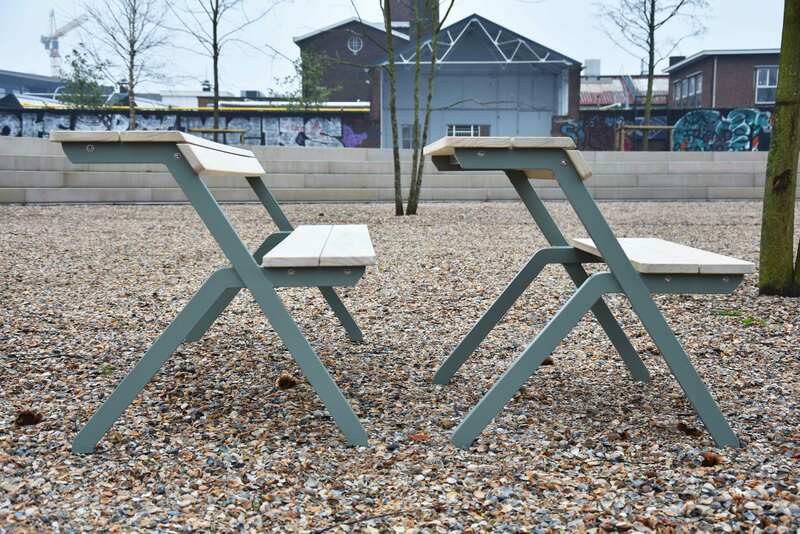 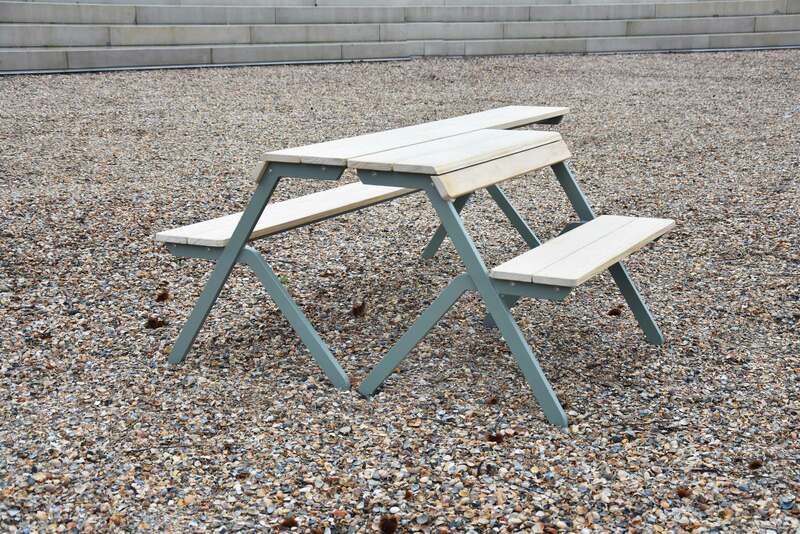 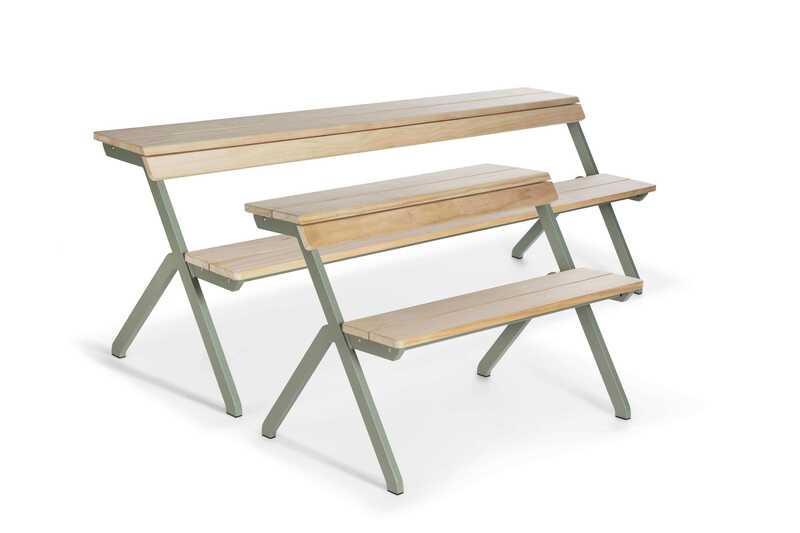 Made from Accoya® wood, an environmental-friendly and highly sustainable choice, and galvanized first then powder coated steel structure, the tablebench is designed and produced for a very long lifespan. 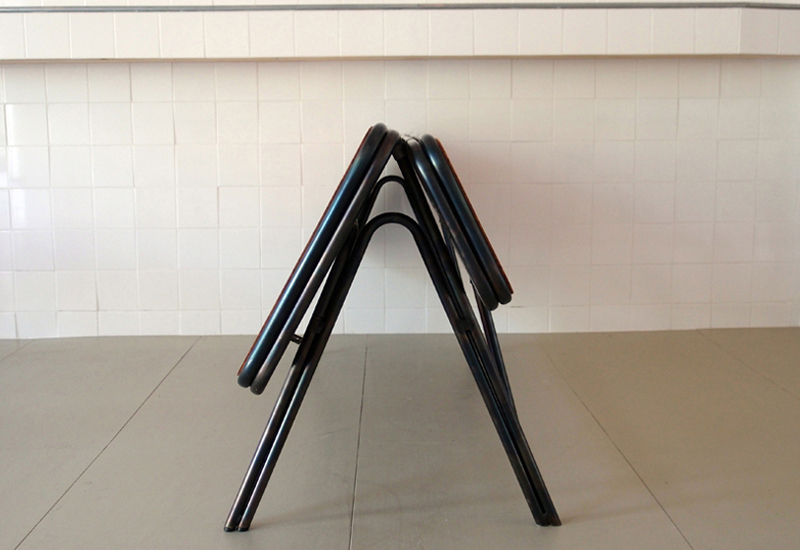 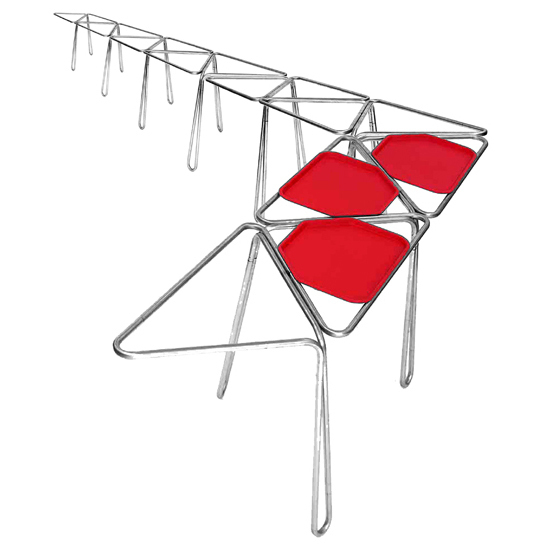 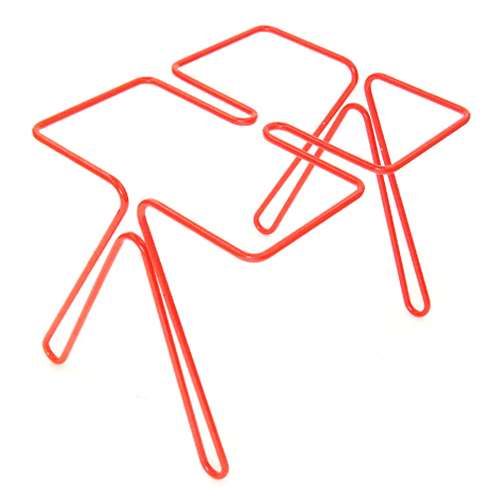 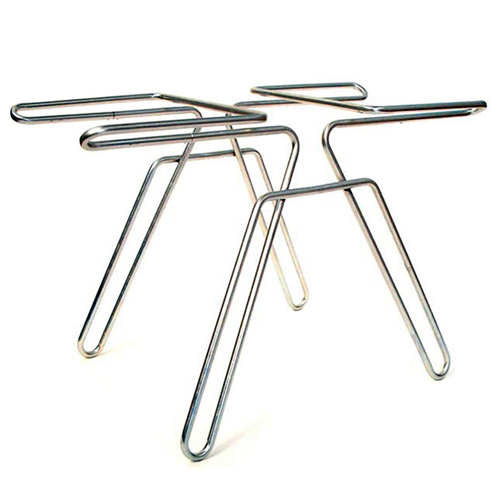 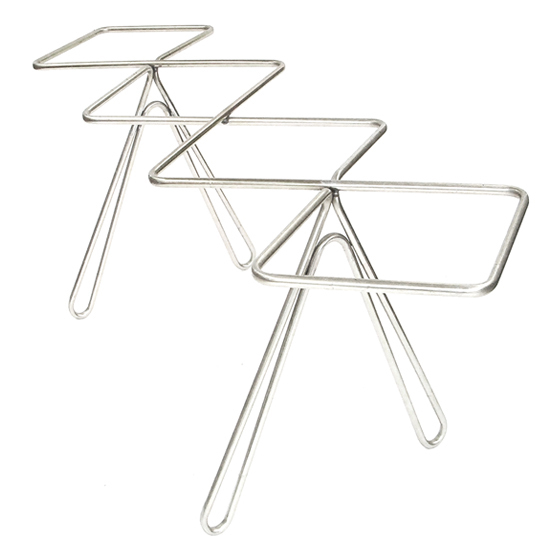 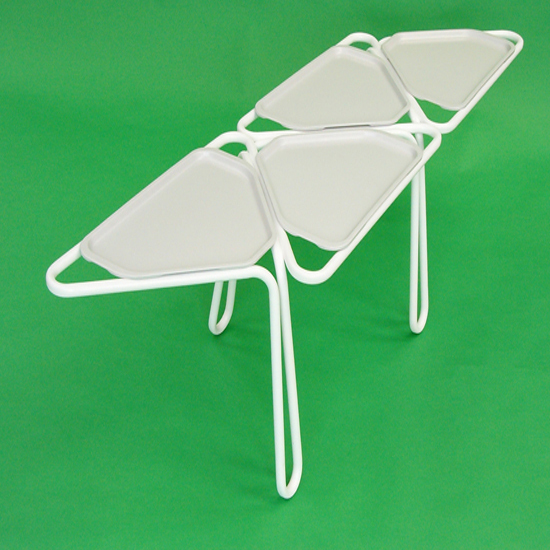 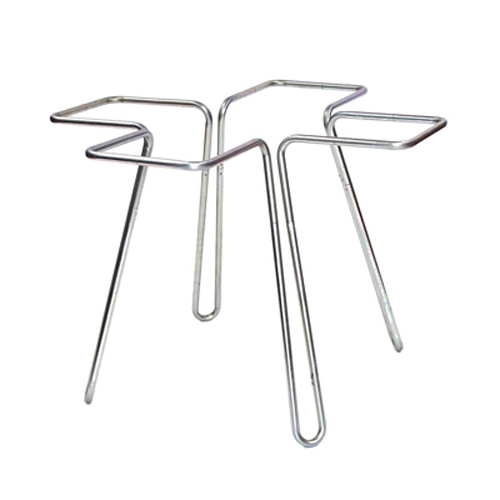 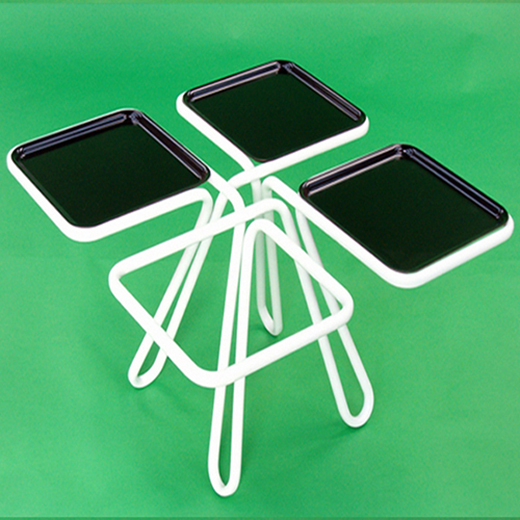 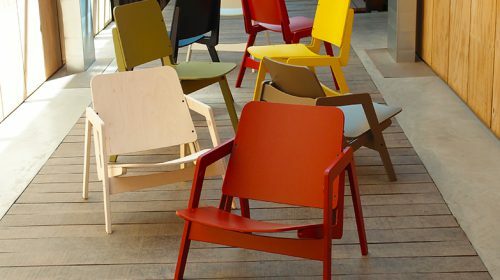 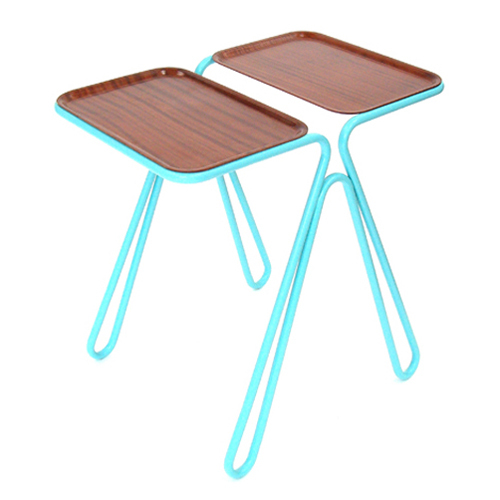 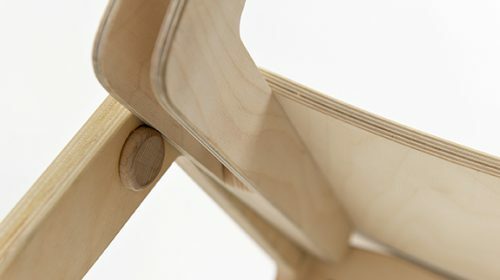 flip chair is a dining chair that converts to an easy chair. 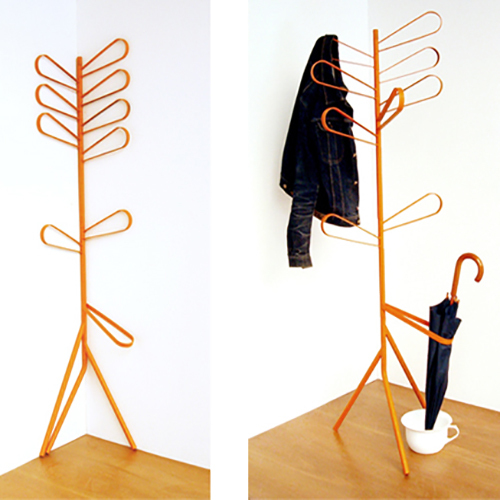 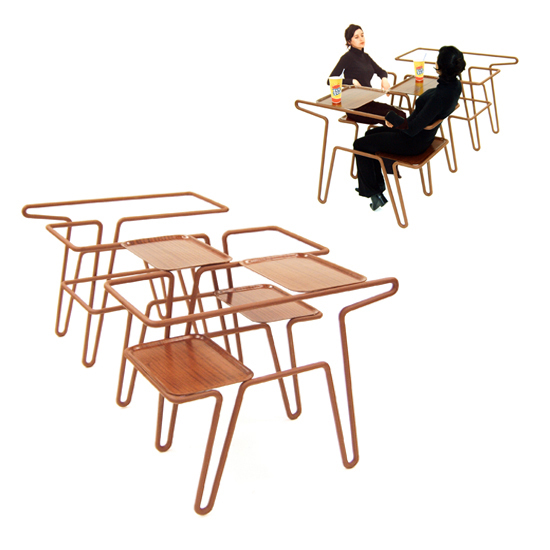 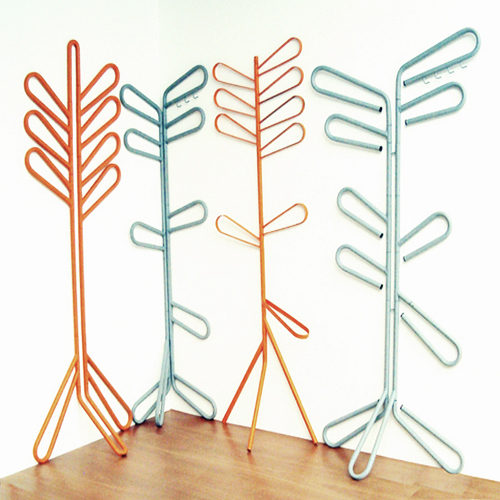 It was originally shown at The Aram Gallery in the 2009 exhibition grassworks, a series of self-assembly furniture experiments in bamboo laminates. 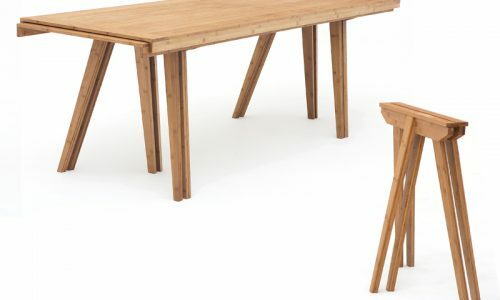 The pieces were designed to suit smaller living spaces, as well as being durable and sustainable. 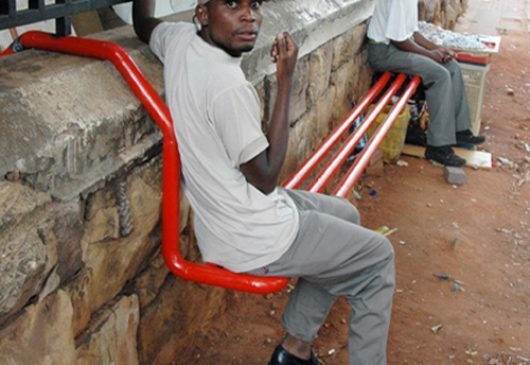 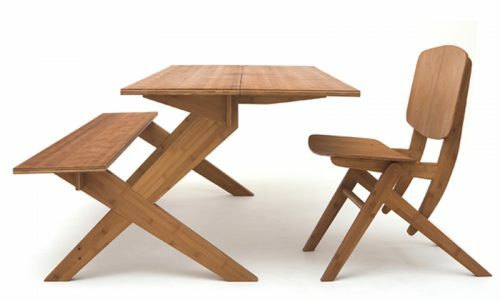 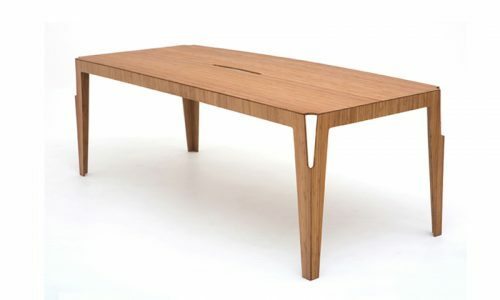 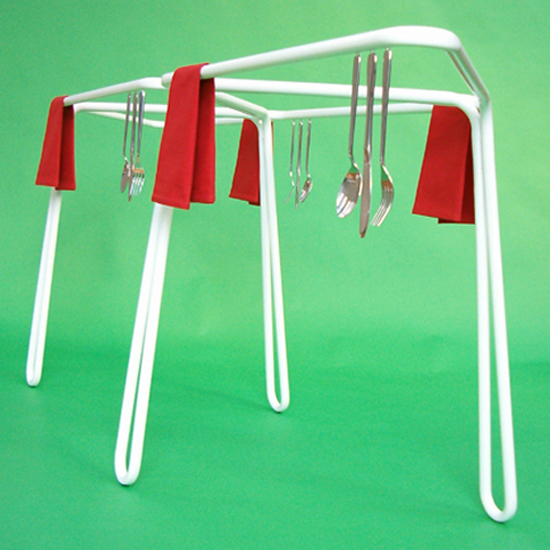 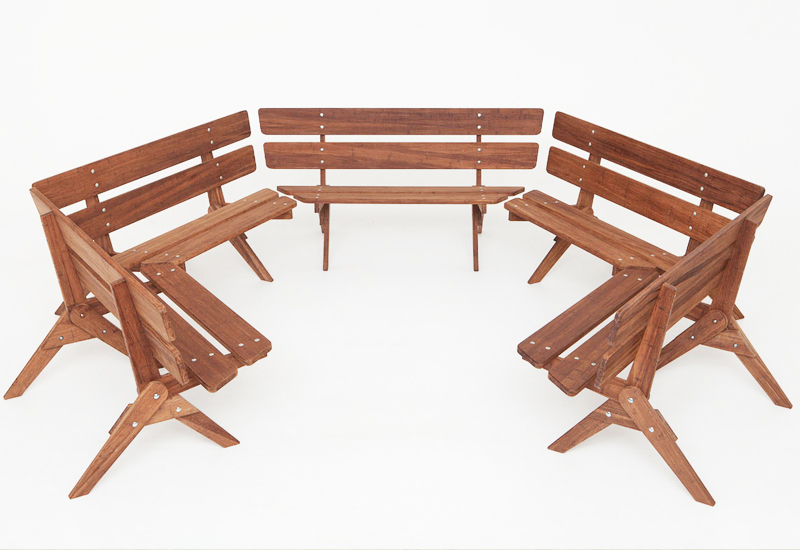 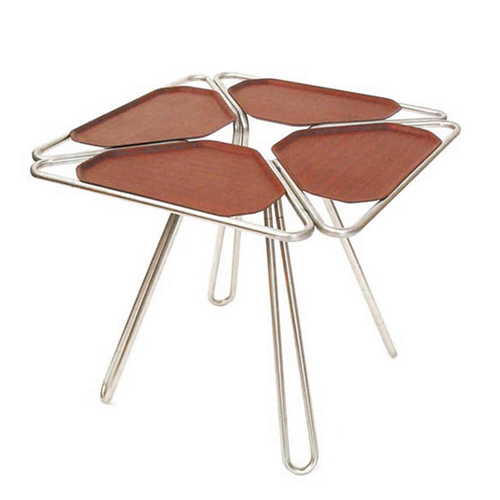 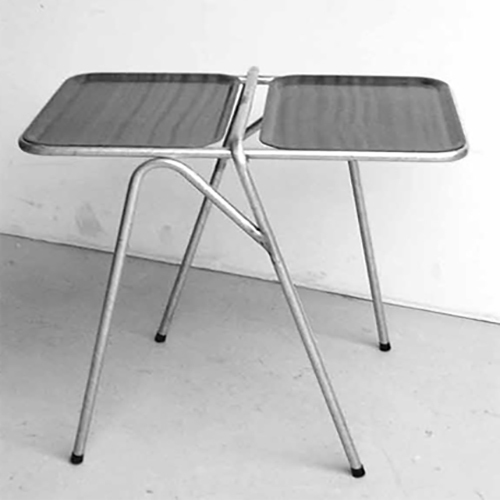 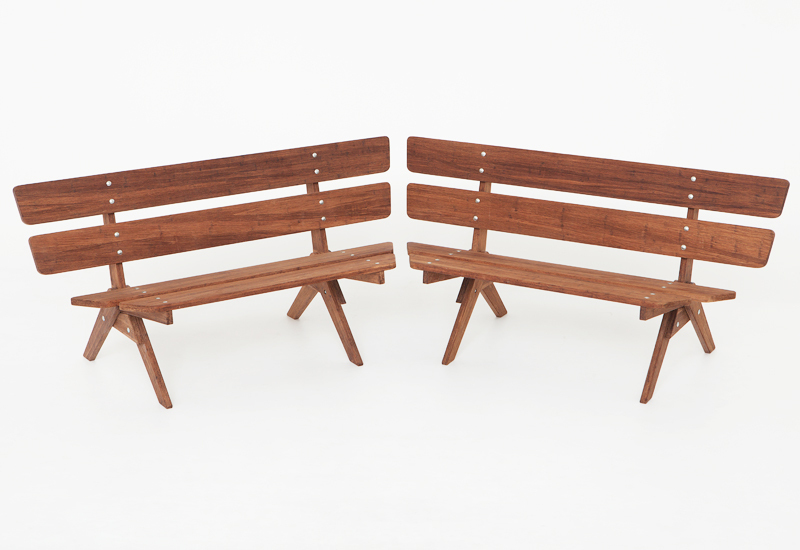 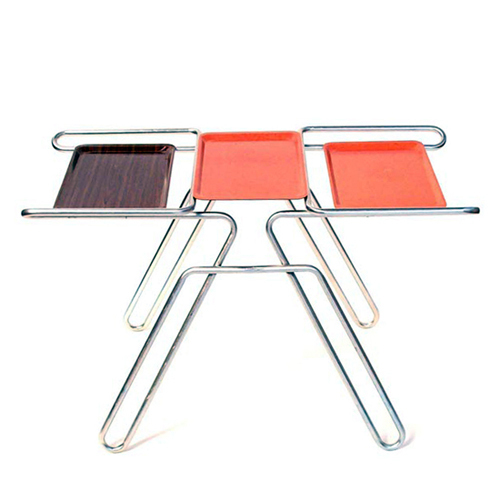 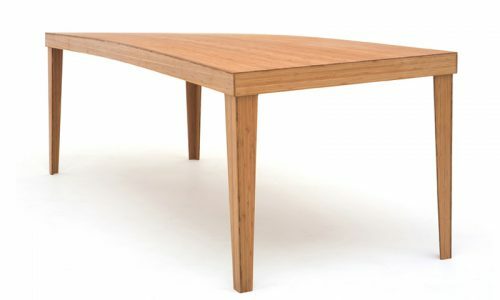 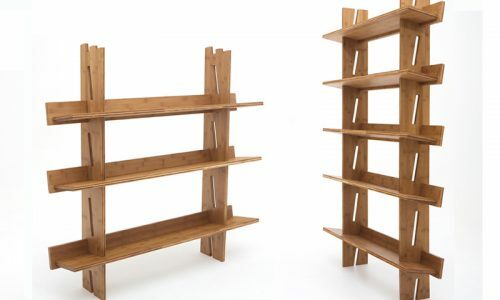 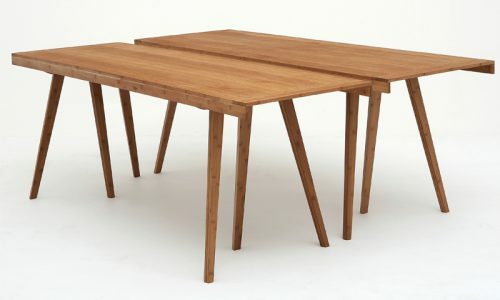 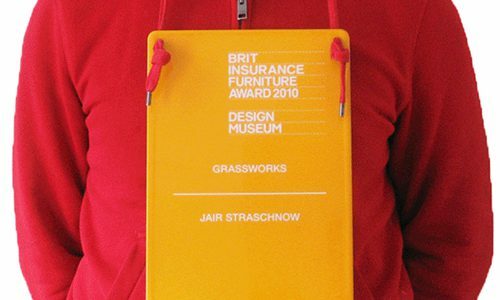 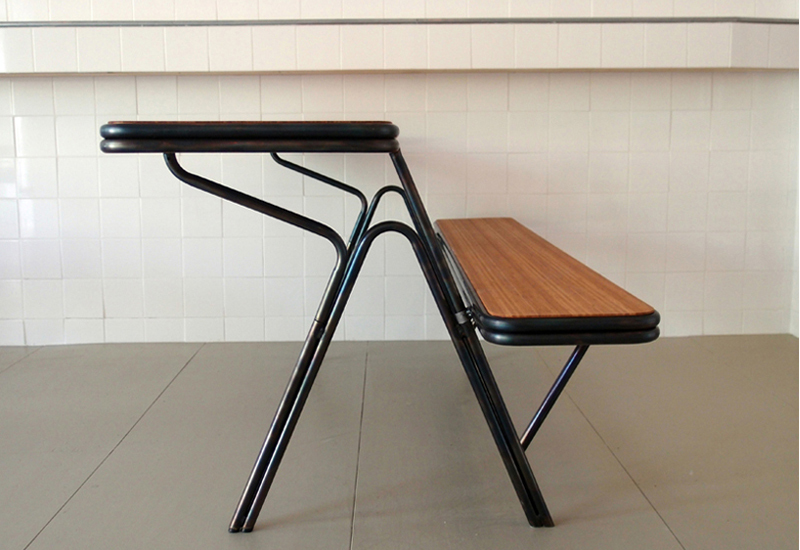 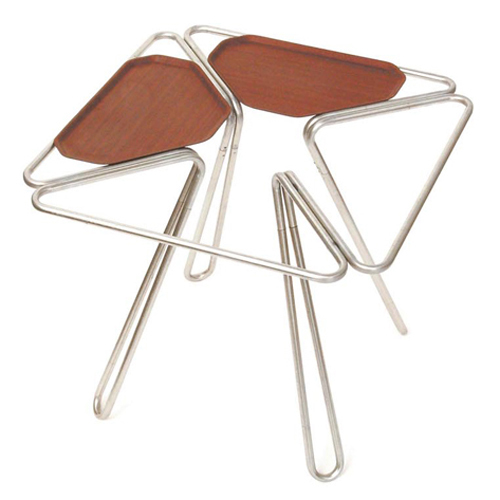 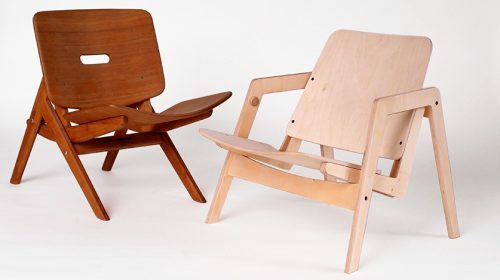 It went on to win the furniture category at the Design Museum’s Designs of the Year awards in 2010. 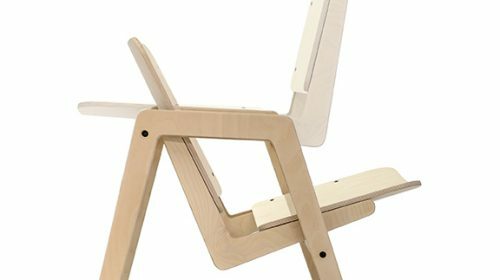 Like the rest of the Grassworks collection, Flip Chair began as a bamboo prototype that was realised quickly through trial and error. 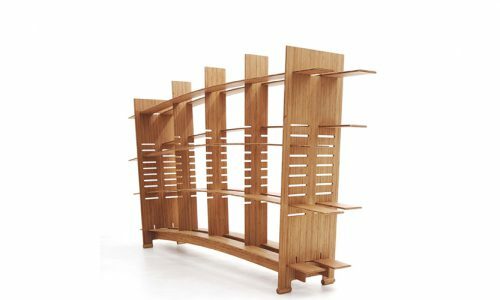 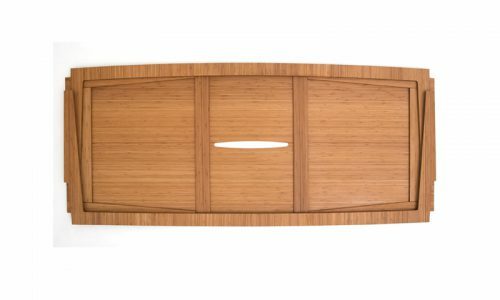 Turning into a finished product was a much lengthier process, with many different incarnations from tubular options to full plywood. 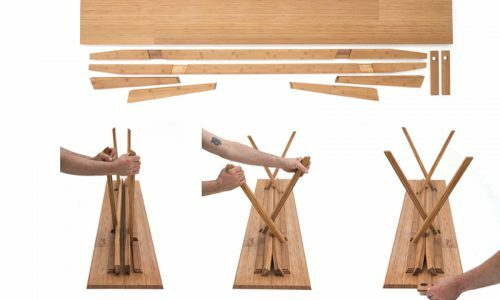 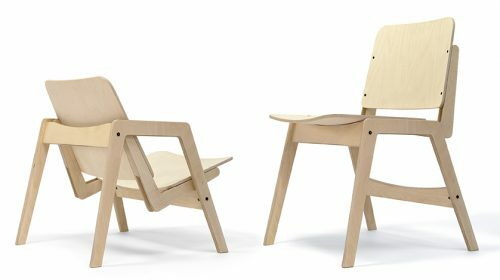 The final version is milled out of a single material (European Birch ply) and has a locking mechanism that makes use of the material’s inherent flexibility. 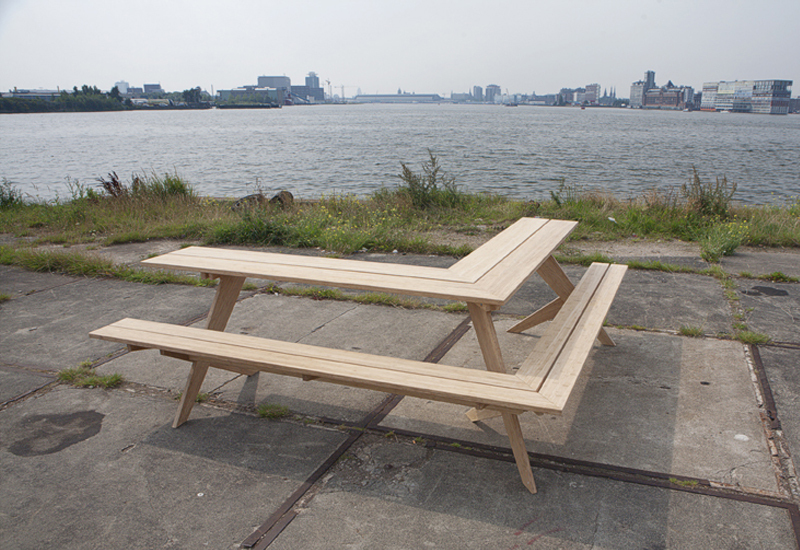 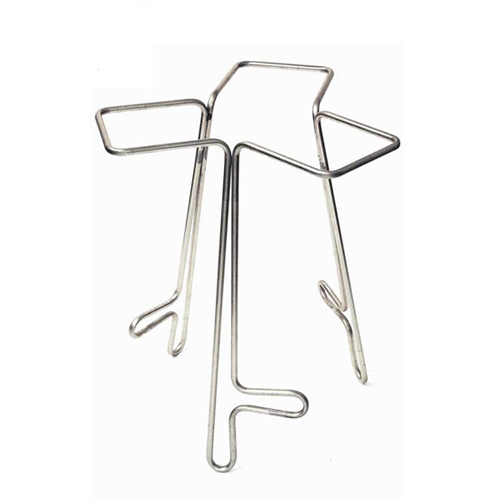 It was developed in collaboration with Amsterdam’s Fiction Factory, who is also producing it. 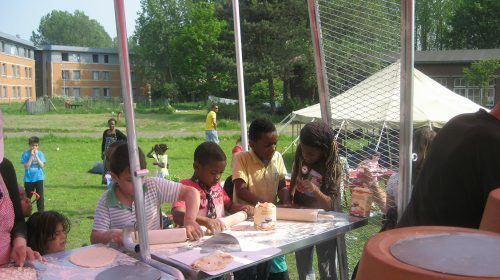 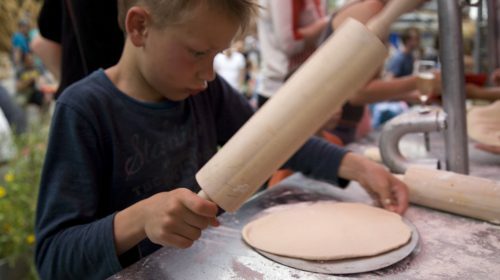 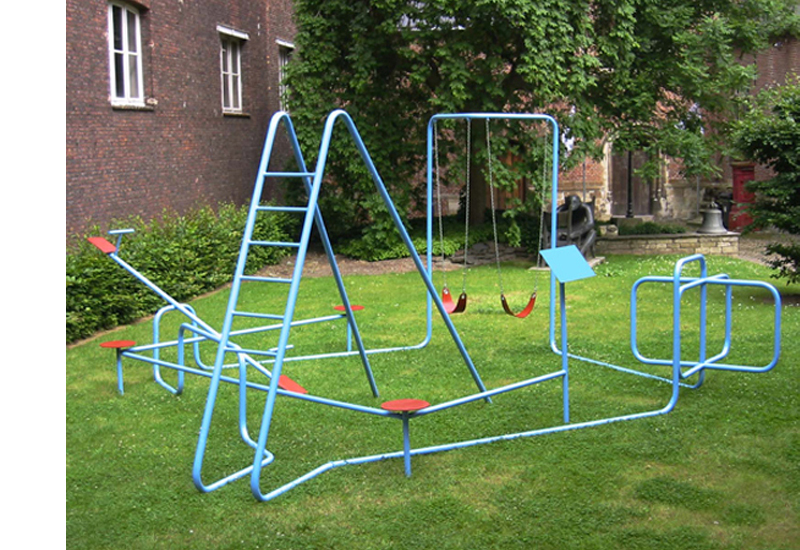 Play is a range of voluntary, naturally motivated activities normally associated with recreational pleasure and enjoyment. 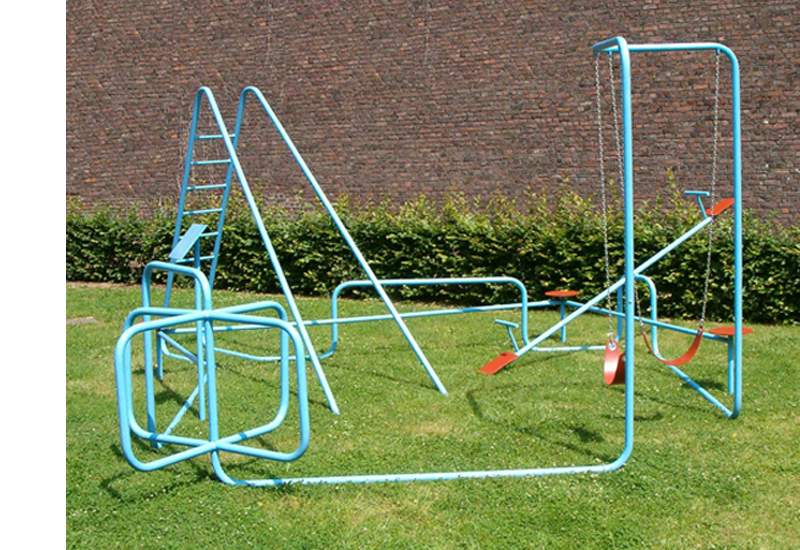 Play is free, is in fact freedom. 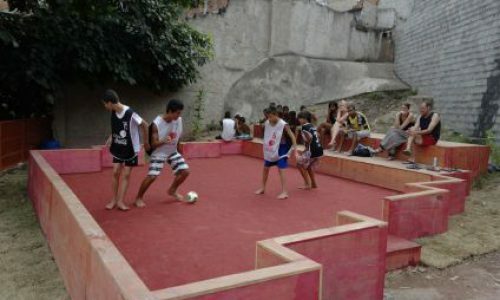 Play is not ‘ordinary’ or ‘real’ life. 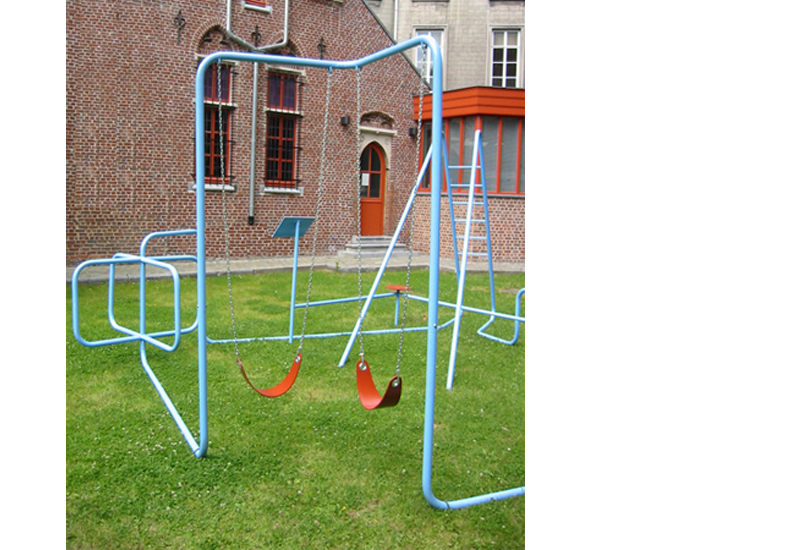 however, Play is most commonly associated with children and their juvenile-level activities, and all playing facilities designed for public space are scaled-down to kid’s size. 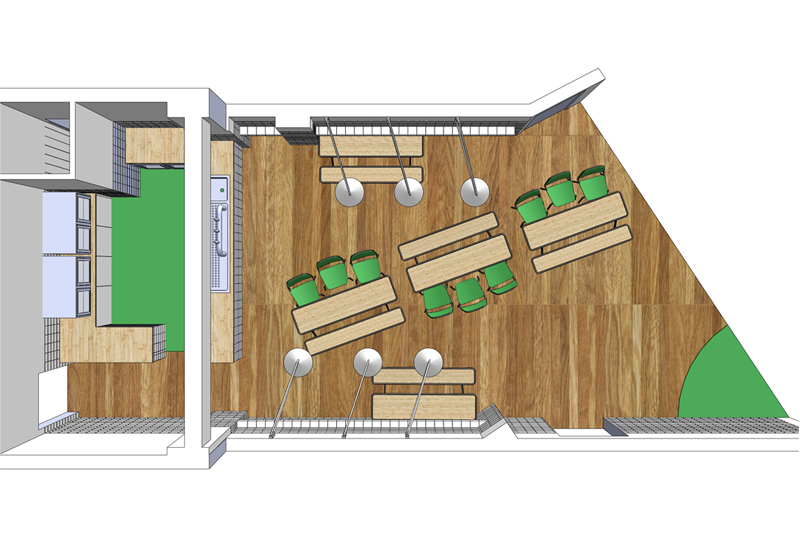 looking further into public areas, the (adult) facilities on offer sum up to seating, normally benches, where comfort is definitely not a priority. 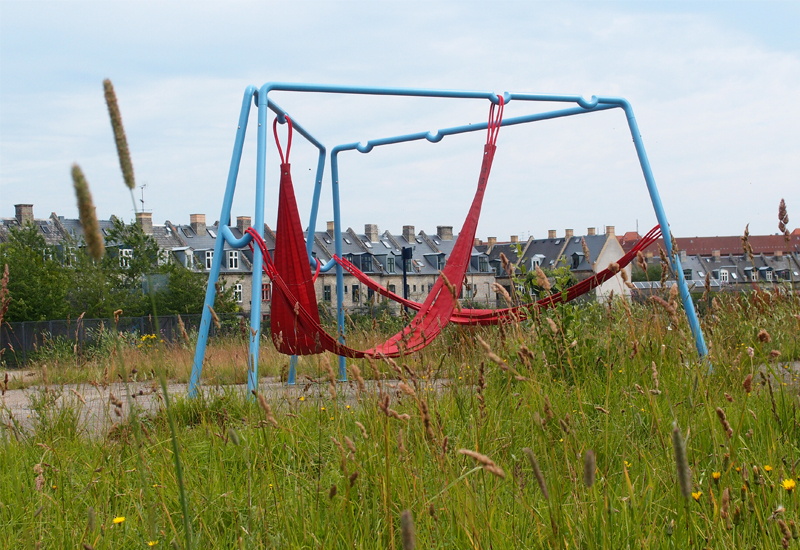 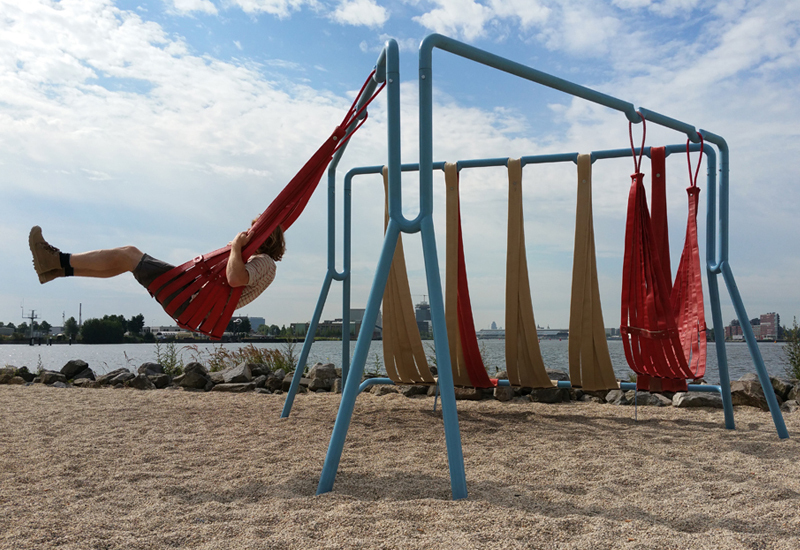 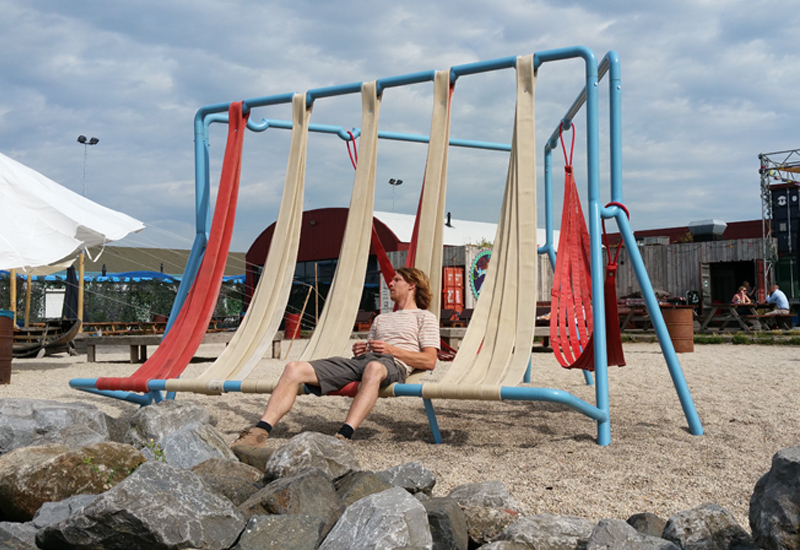 considering how essential Play is to our well being, and how predictable our public space is, off- ground is about up-scaling playing elements combined with seating alternatives – hanging, floating, swinging, laying – one size fits all. 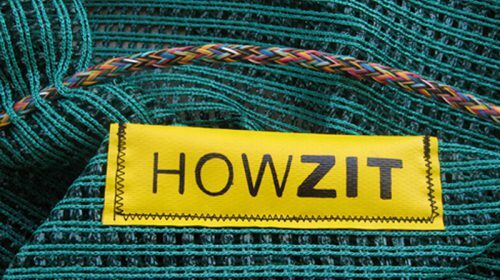 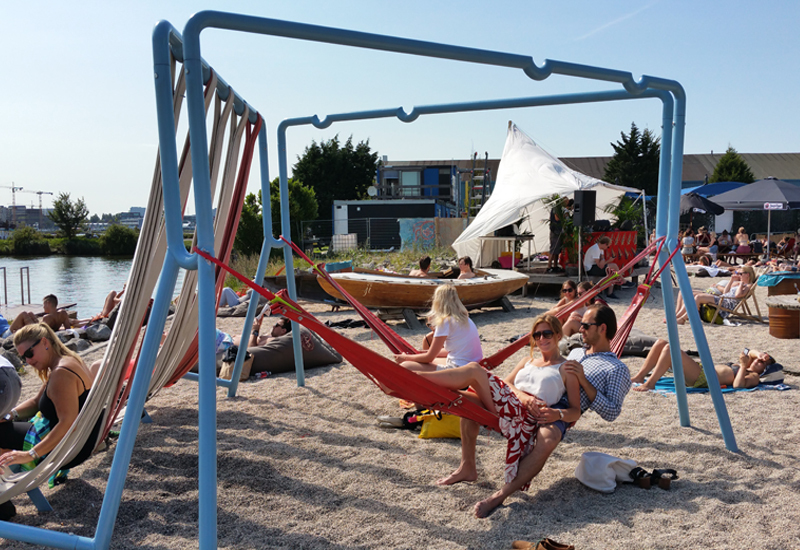 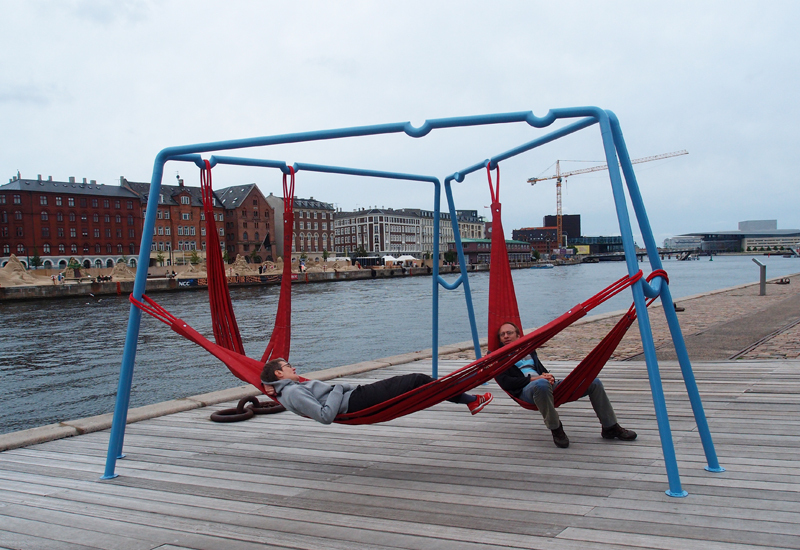 the hammocks/seats are locked in the steel structure and can easily be moved from a low seat to a hammock or a swing. 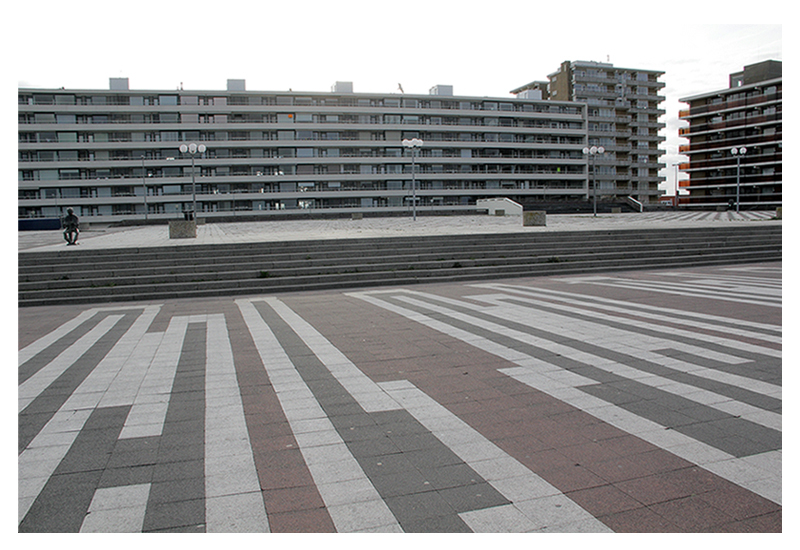 realized at SVFK Copenhagen, spring 2013.
locations: DAC(danish architecture center), Copenhagen. 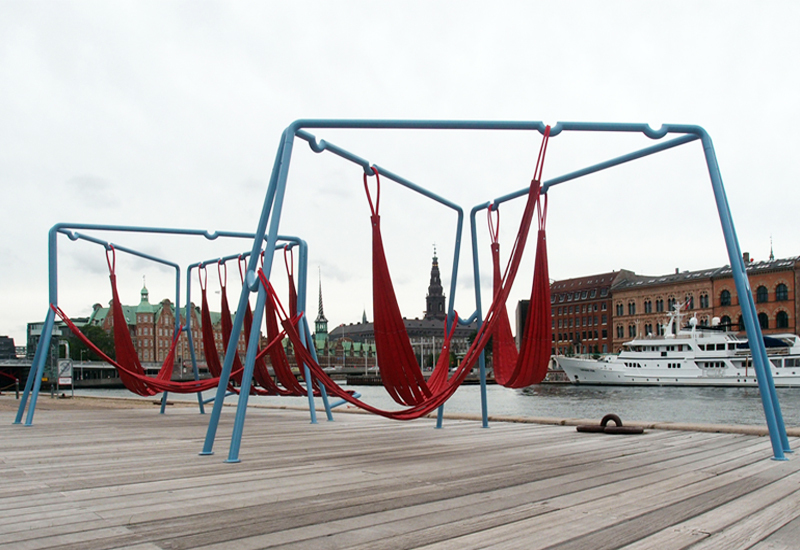 Carlsberg-byen, Copenhagen. 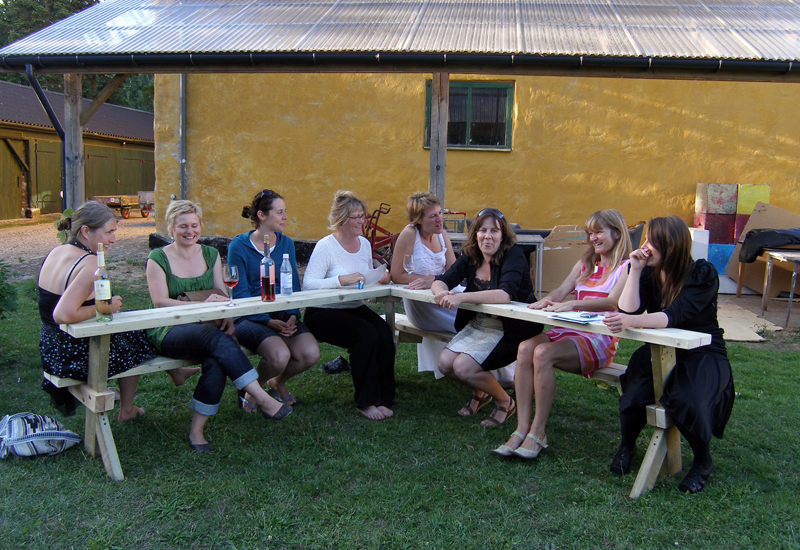 Art School Holbæk. 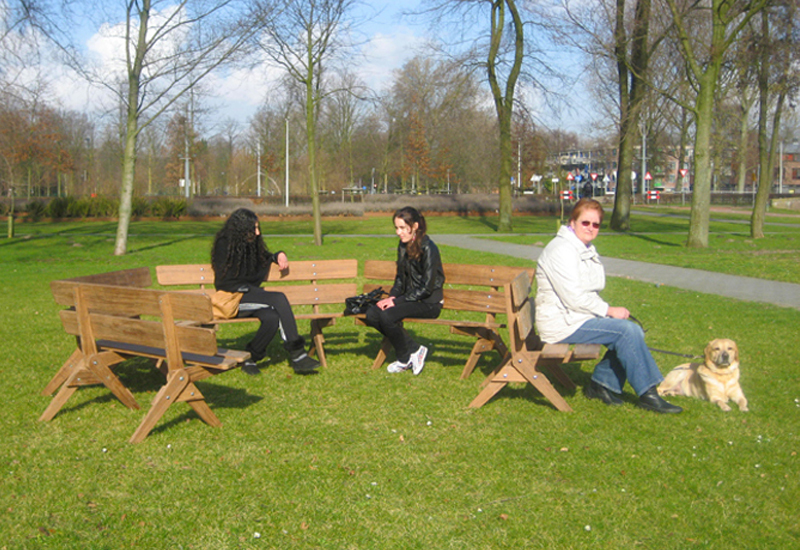 Pllek, Amsterdam. 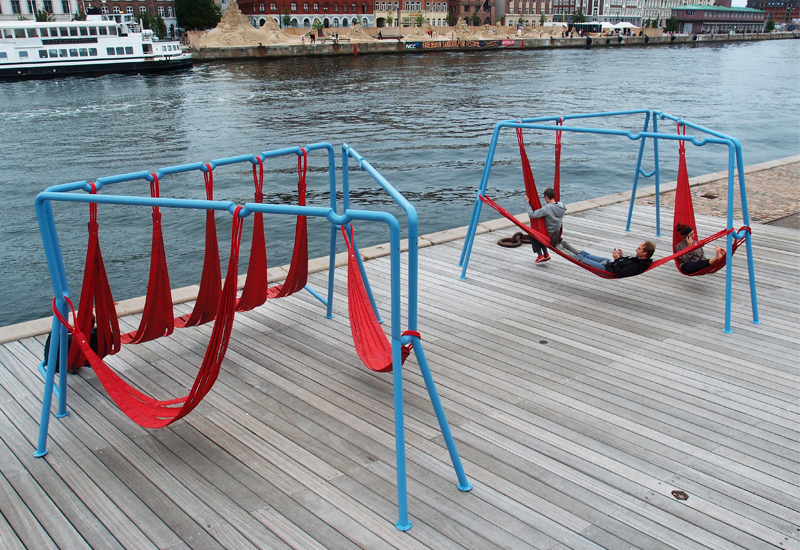 Newburyport, Massachusetts. 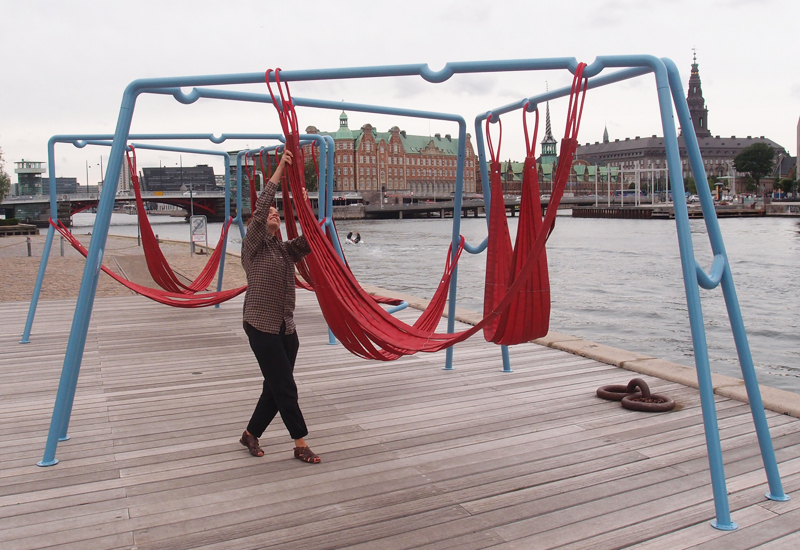 a collaboration with gitte nygaard. 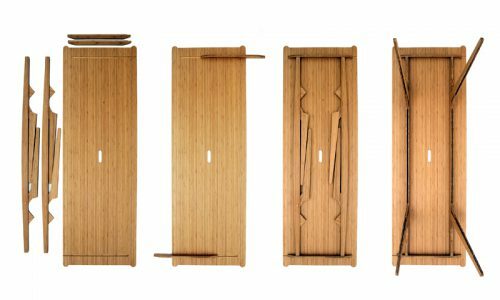 grassworks is series of experiments in tool-less self-assembly furniture; a range that is designed to be simple, space-saving and wholly sustainable. 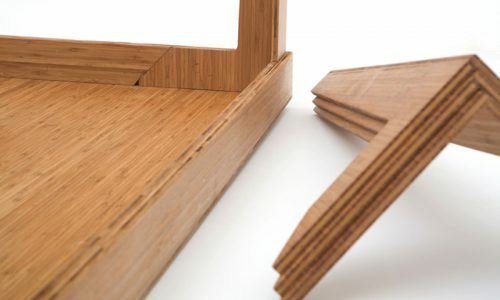 Bamboo, the fastest growing plant on earth, is a grass, hence the title grassworks. 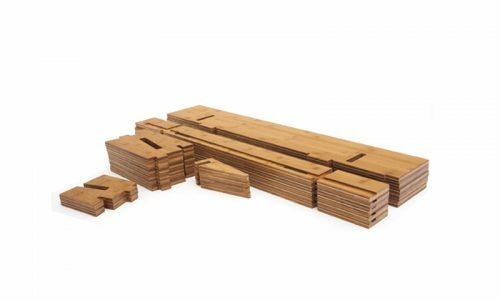 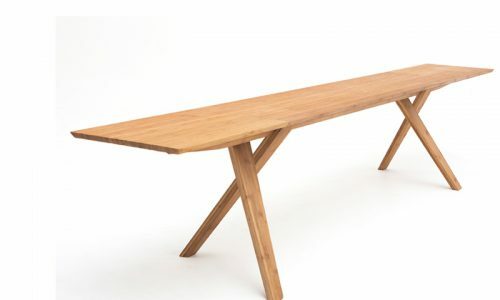 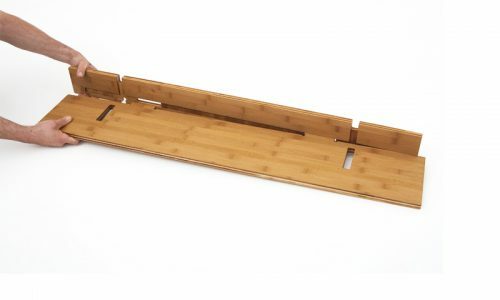 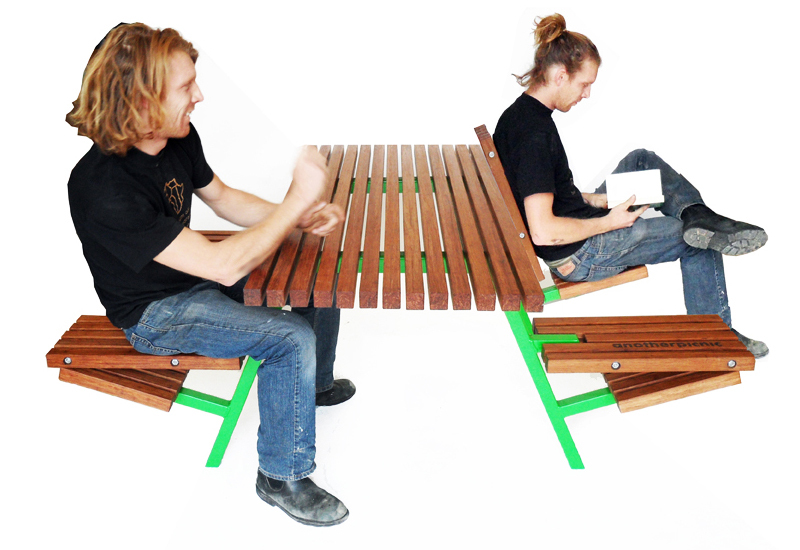 this new variation of the iconic picnic table, made out of pressed bamboo, is trying to tackle two issues: splitting the bench into separate seats results in easier access on the one hand, but also offers another option- a more relaxed low seating position. 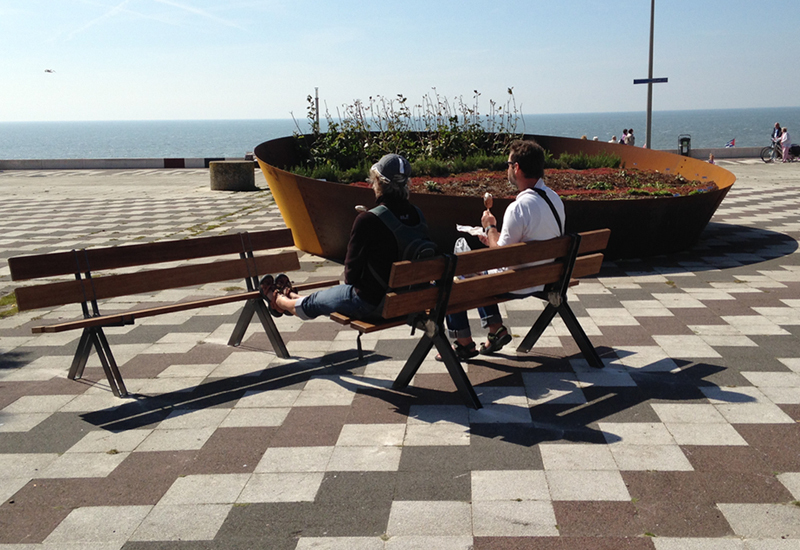 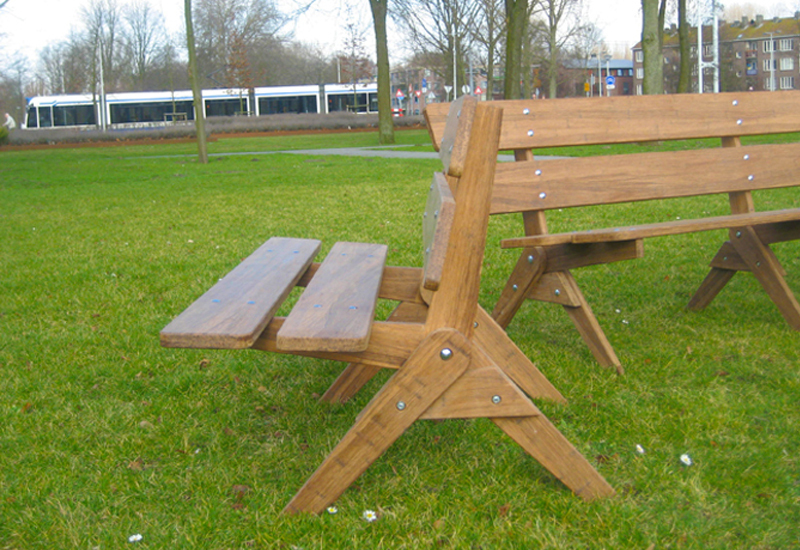 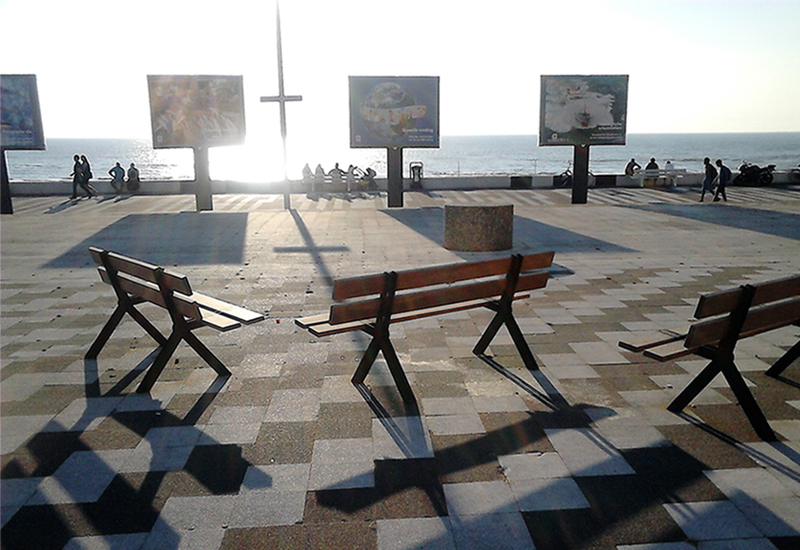 while there are numerous benches for public space, easy chairs are never to be found in parks and leisure areas, where one would expect them most. 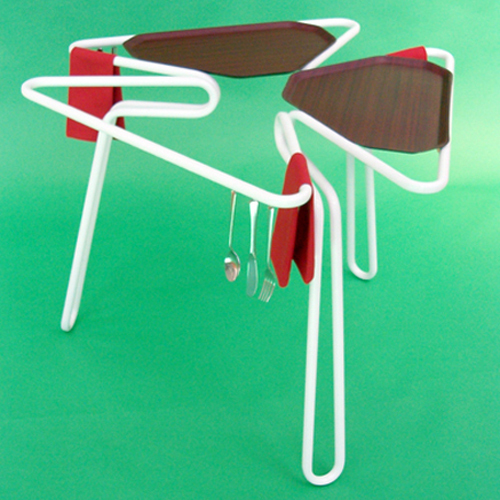 a collaboration with Wouter Nieuwendijk. 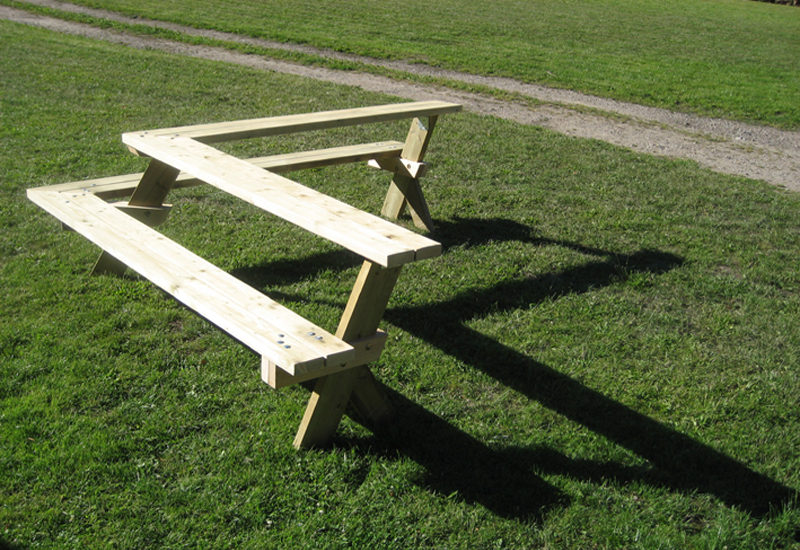 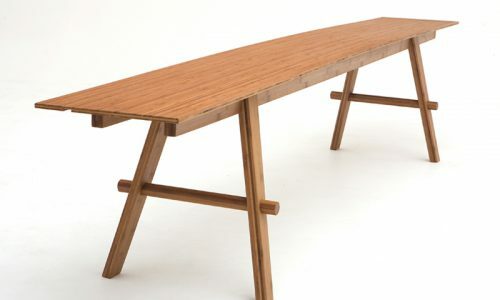 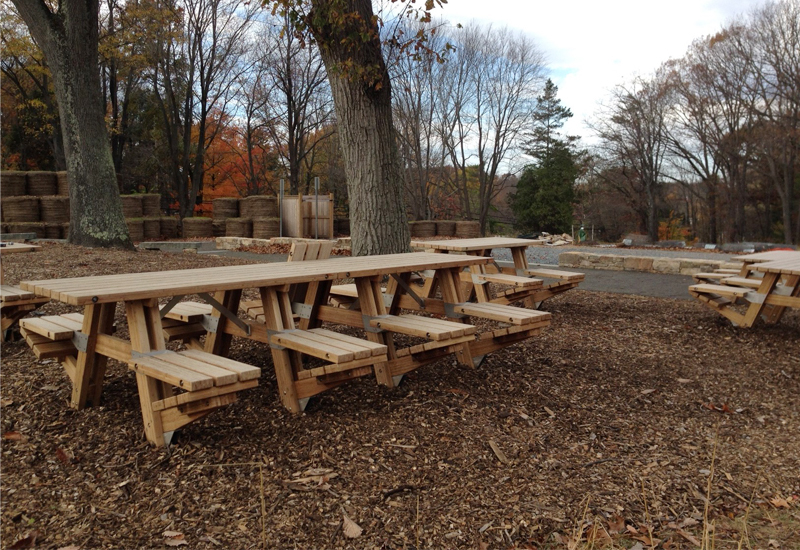 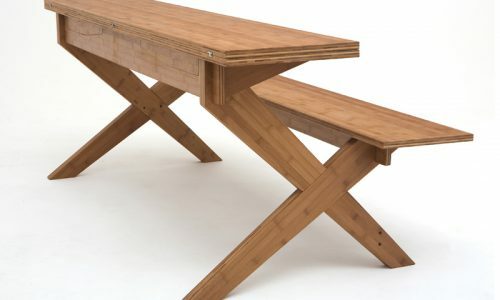 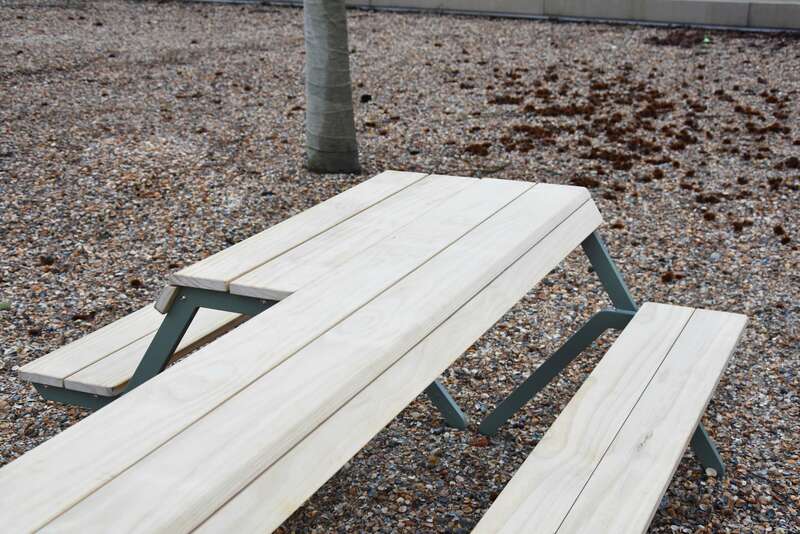 another take on the iconic picnic table, this one is sliced and opened. 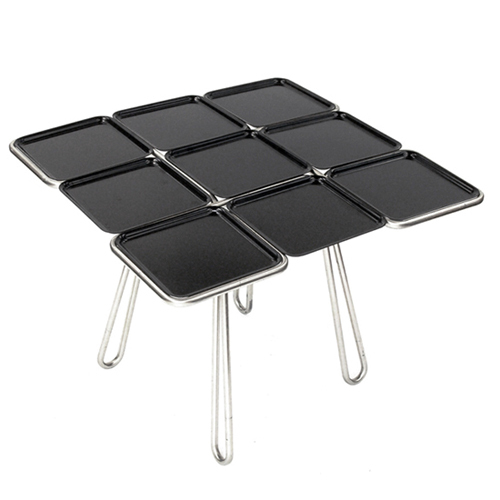 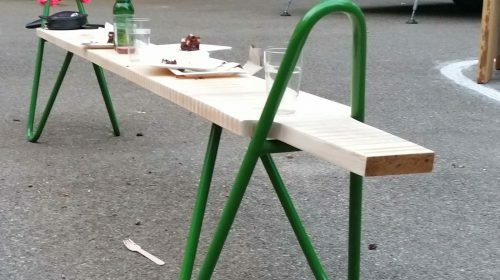 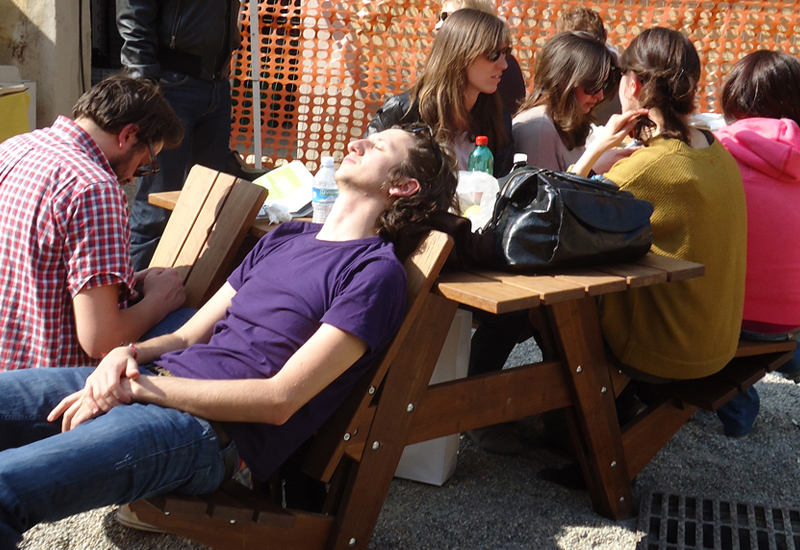 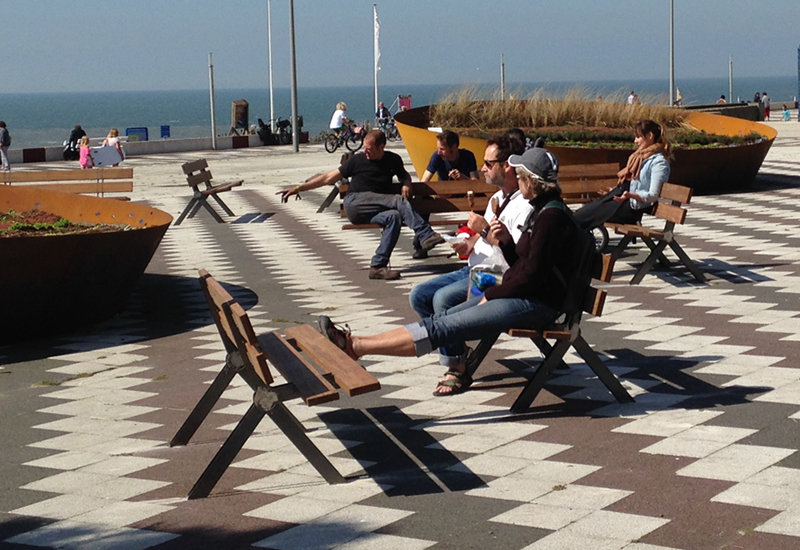 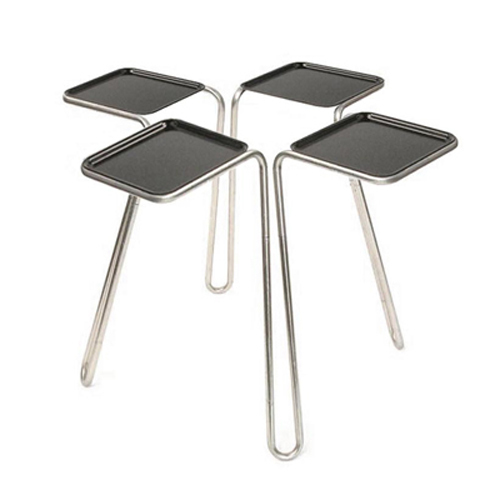 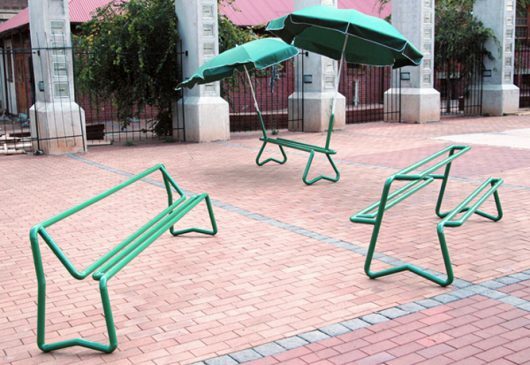 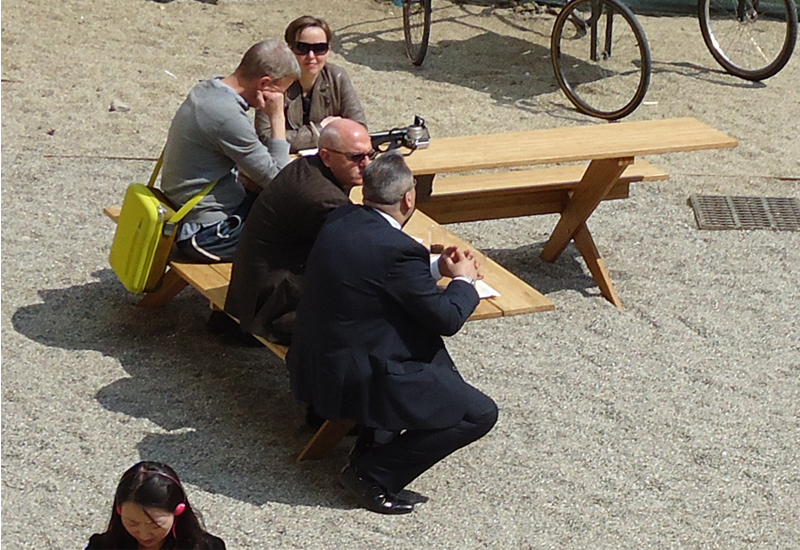 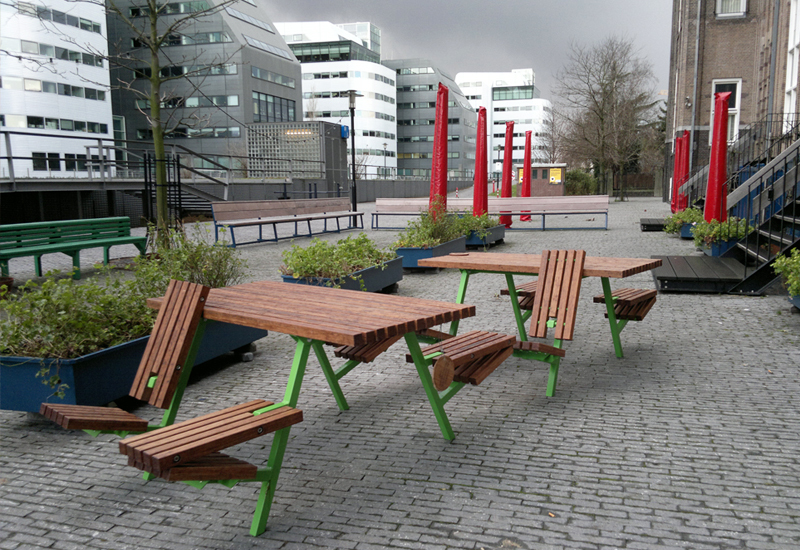 in contrast to its original, the eLpicnic is designed to minimize contact between users, allowing more people in a public space to use the same table. 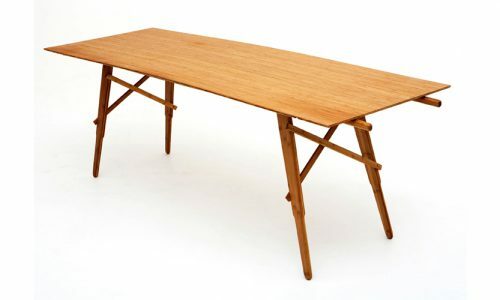 made out of pressed bamboo (earlier version out of pine). 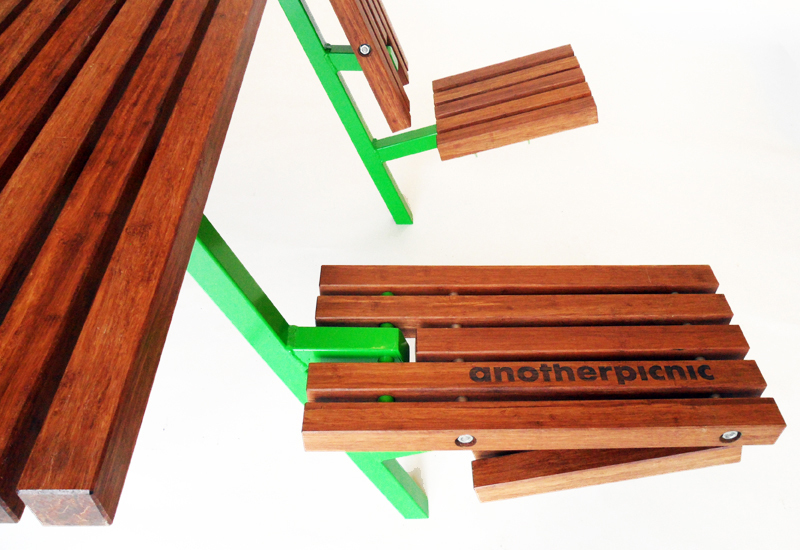 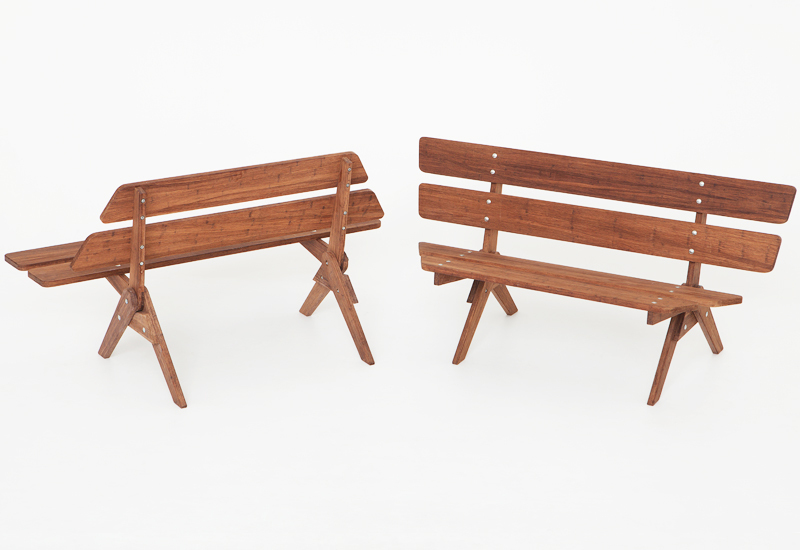 without any real mechanism, this bench consists of a few simple parts and can be flipped easily from side to side – watch the sunrise, watch the sunset. 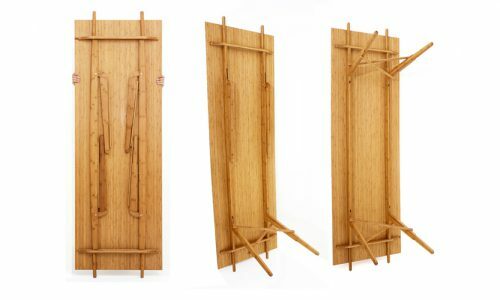 made out of pressed bamboo. 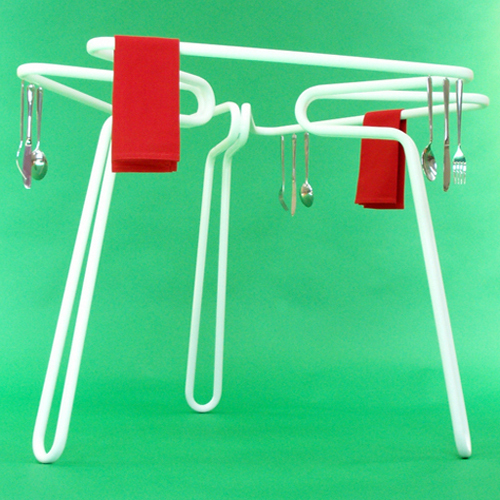 a collaboration with Wouter Nieuwendijk. 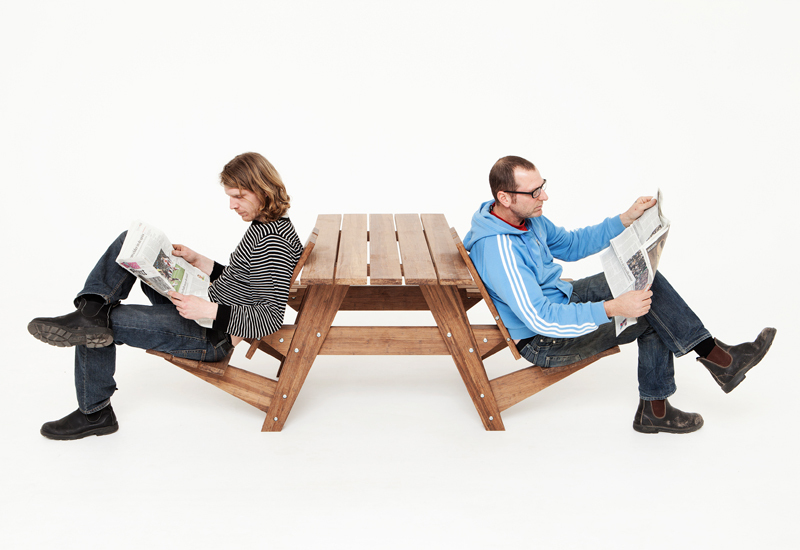 the circular version, (a)social bench, was a commission for Esterni, Milano. 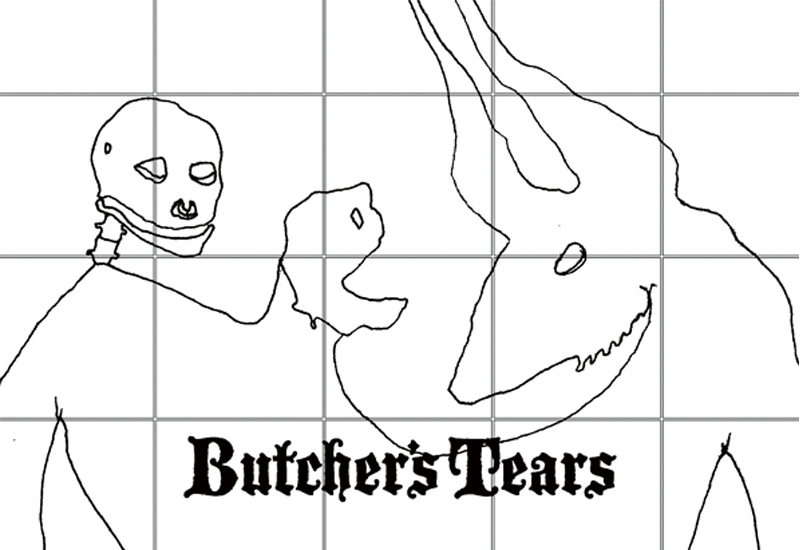 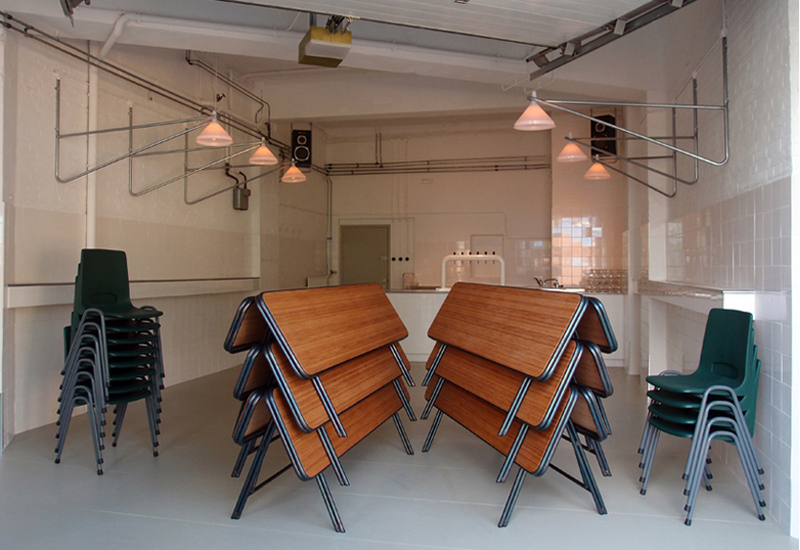 after thirty years of beer drinking practice,i was finally asked to design a bar… or to be more precise a proeflokaal, the tasting room of butcher’s tears, a new brewery in amsterdam. 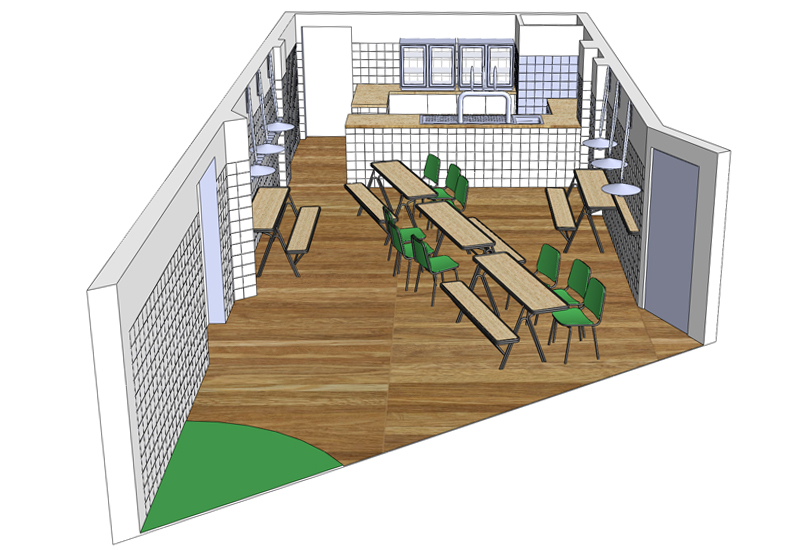 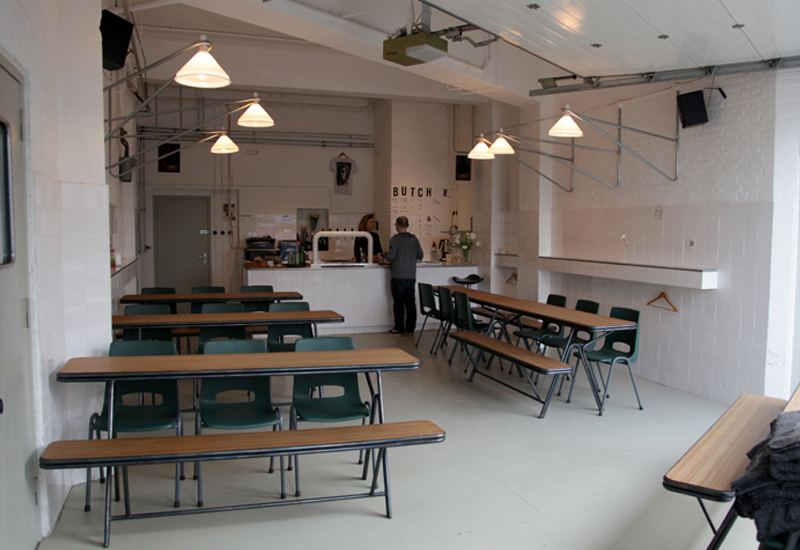 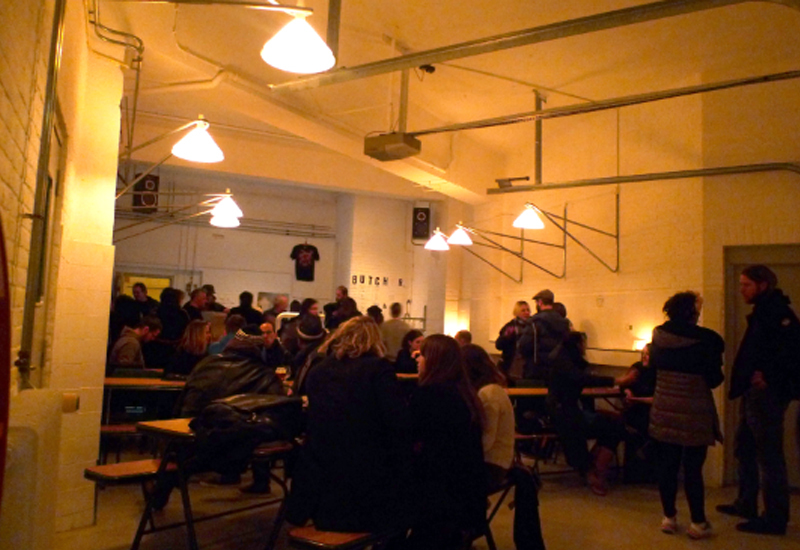 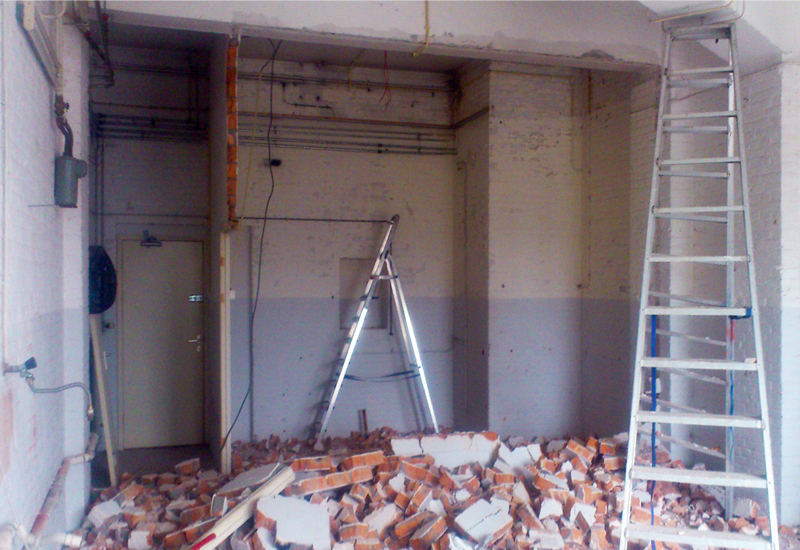 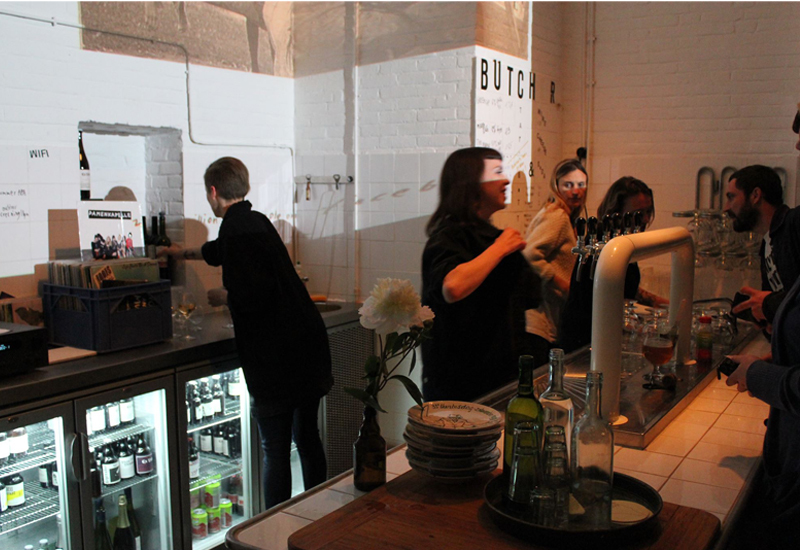 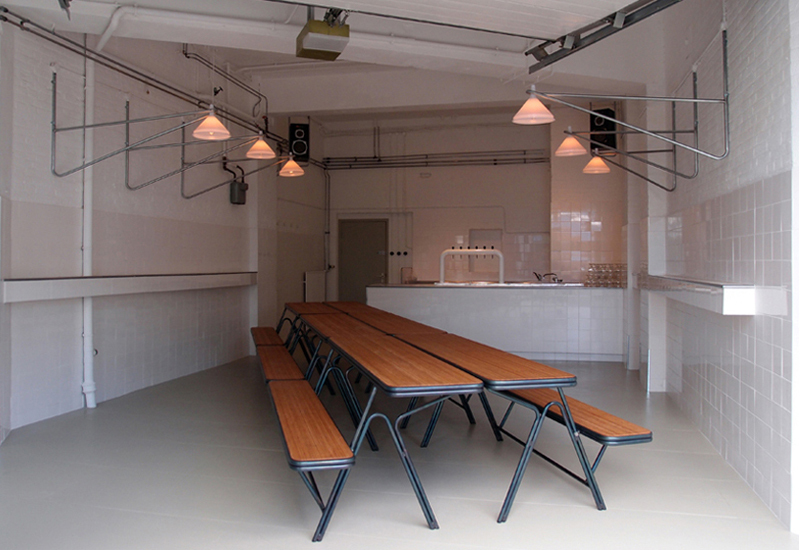 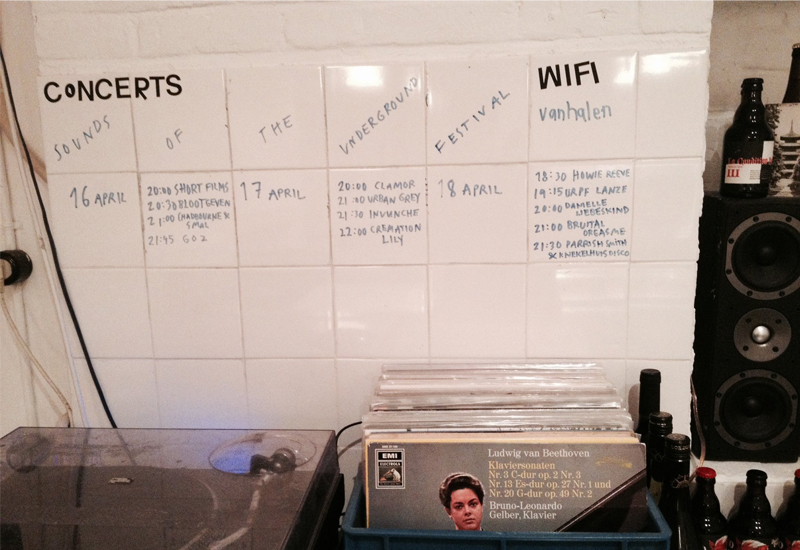 a simple division of the space, large bar at the back, white tiled walls. 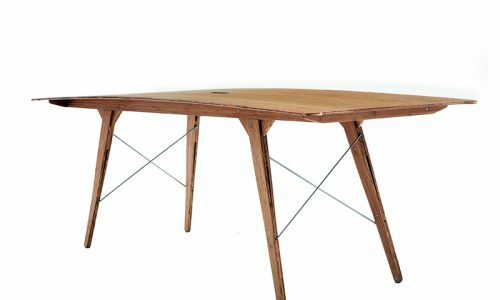 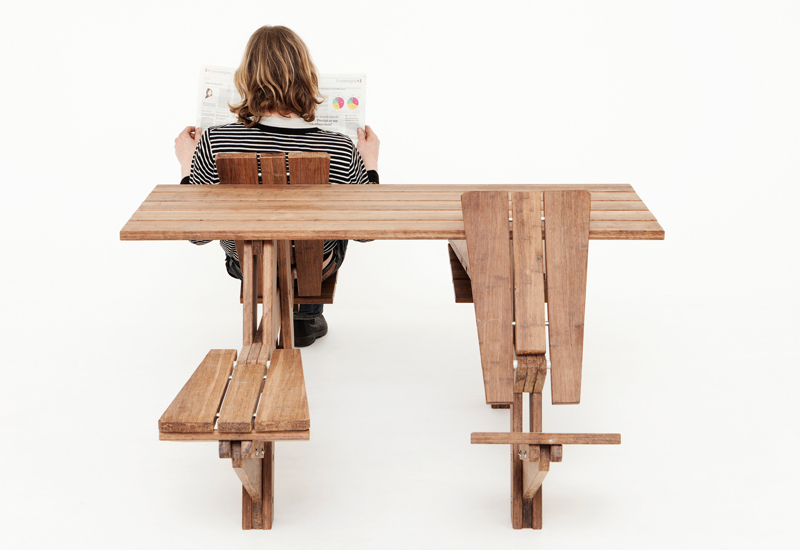 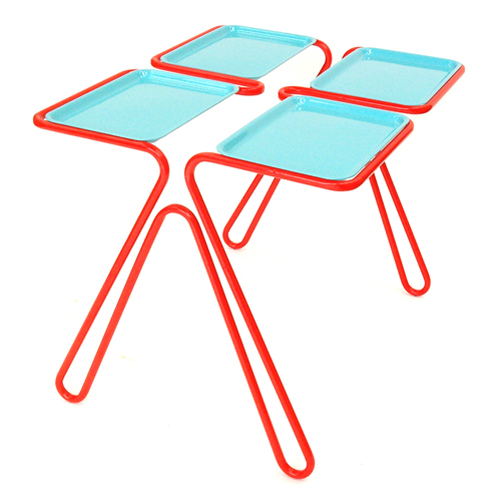 the table/bench, made of rejected steel pipes and bamboo, is the Lego block that enables flexible settings; from one long table to a maximum seated capacity of 50 thirsty on the 50 square meters, thru numerous options in between. 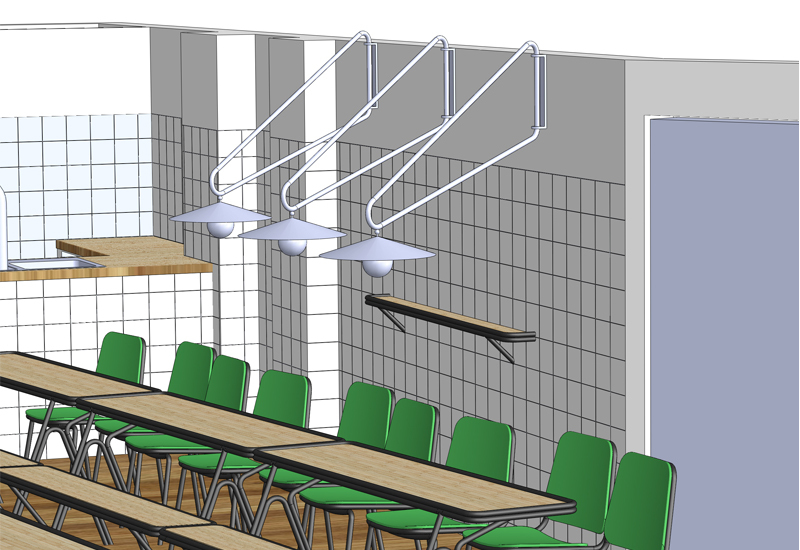 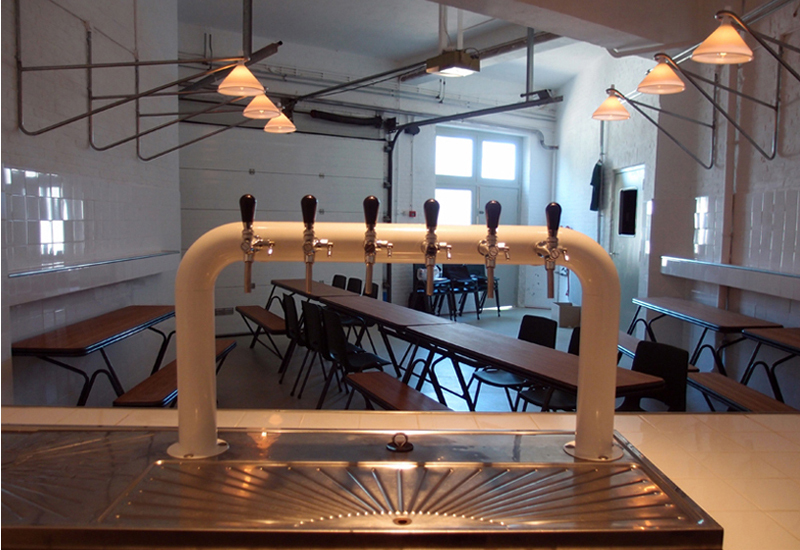 arm lamps that can swivel and follow the different configurations, custom beer bridge, six beers on tap. 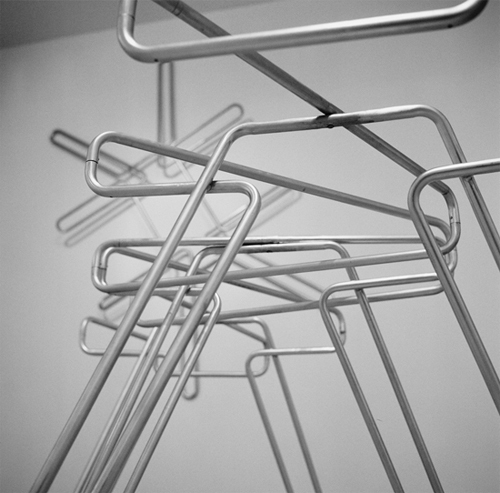 pipework is an indirect response to permanent questions, a tryout in re-setting artificial scales and cancelling hierarchies. 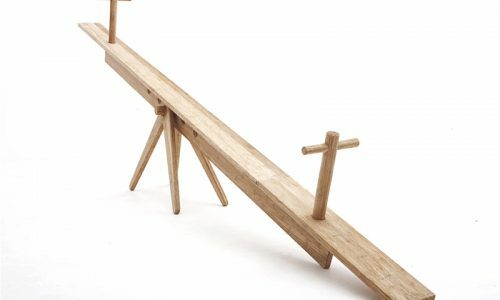 Creating a world that is more horizontal rather than vertical, where there is no centre,no beginning nor end, and every place is as good (or no worse) than the other. 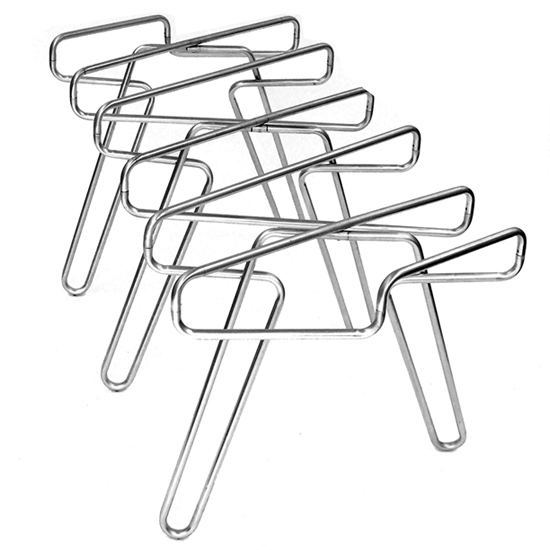 In a loop, every point is as important. 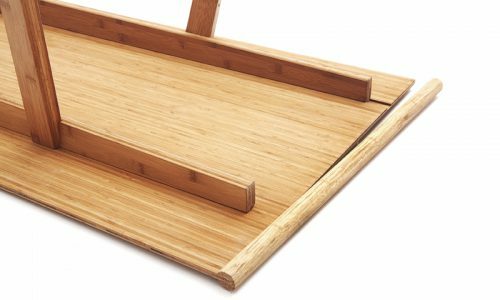 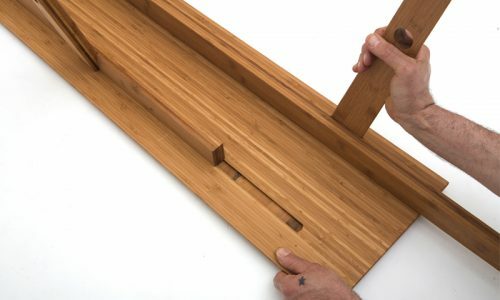 separating the tabletop from its structure and replacing it with standard cantina trays, resulted in a new type of object when not in use, which is most of the time. 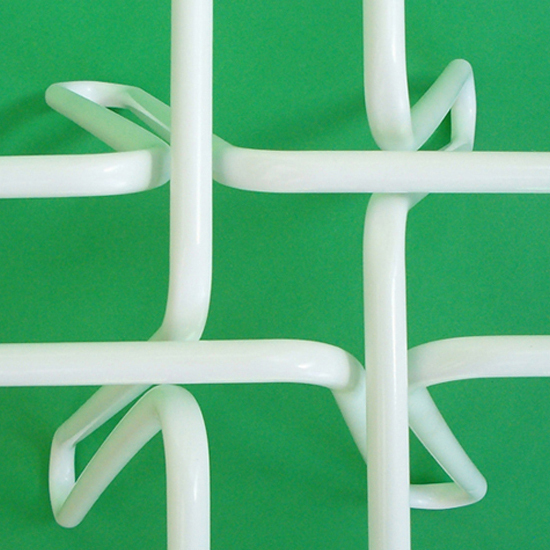 pipework is about developing systems, creating problems and not always offering solutions. 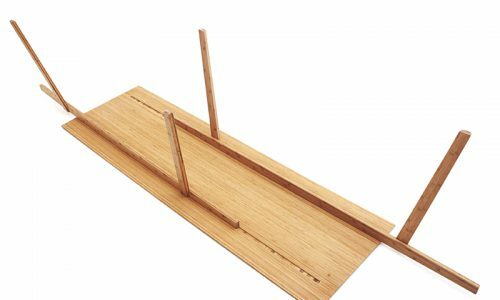 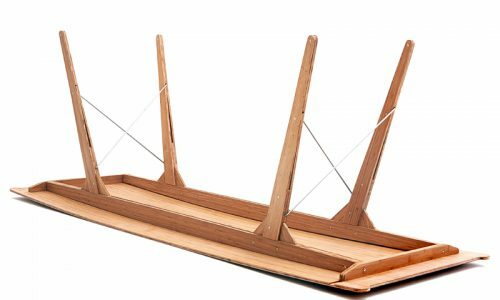 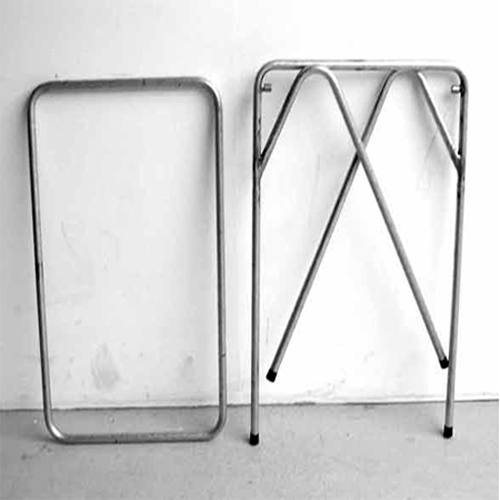 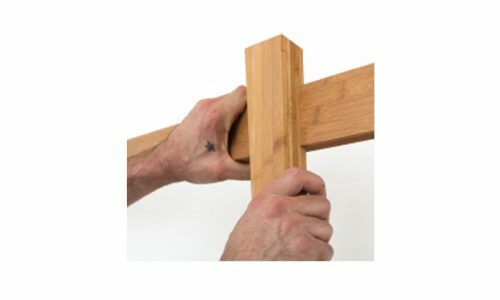 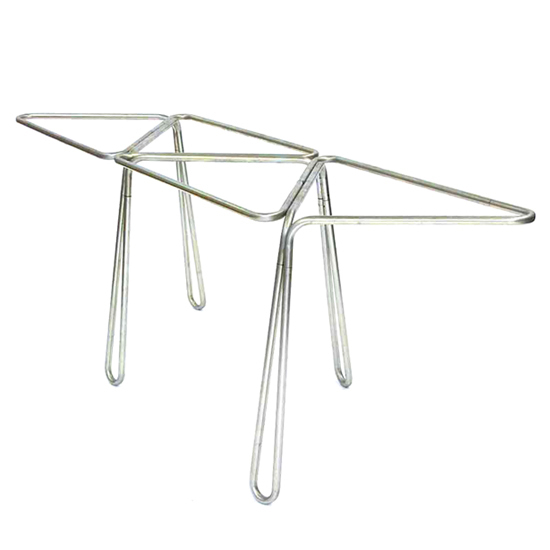 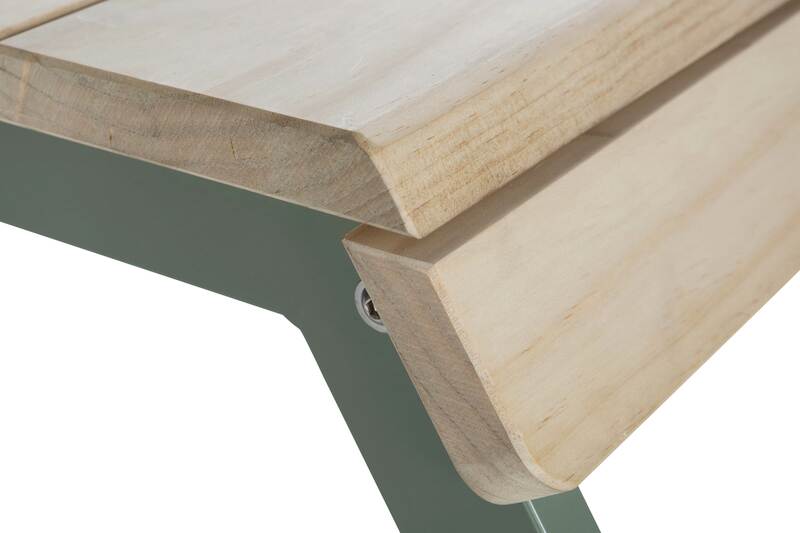 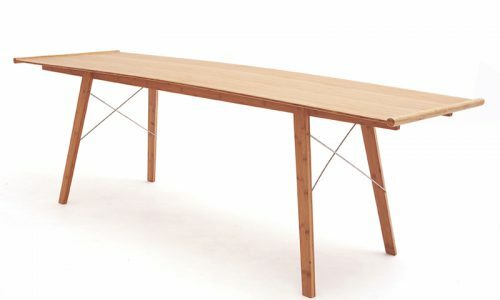 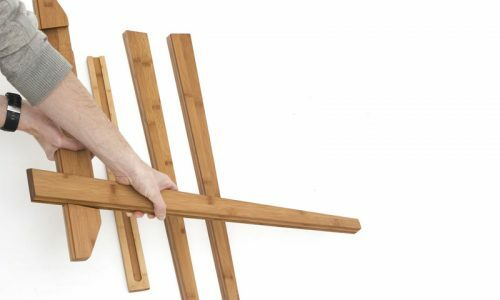 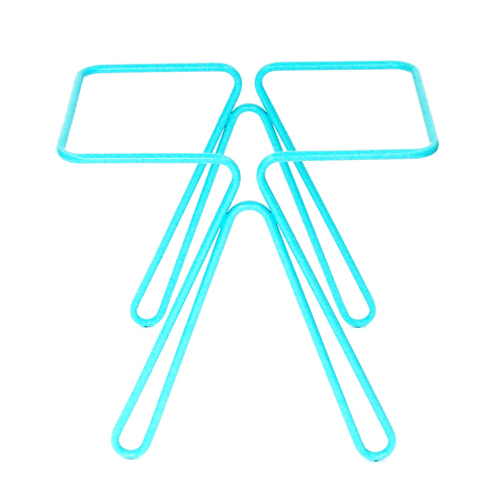 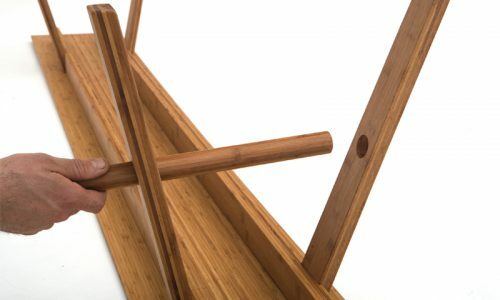 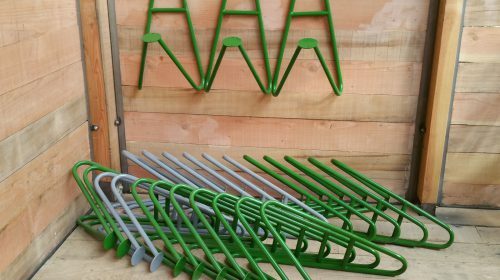 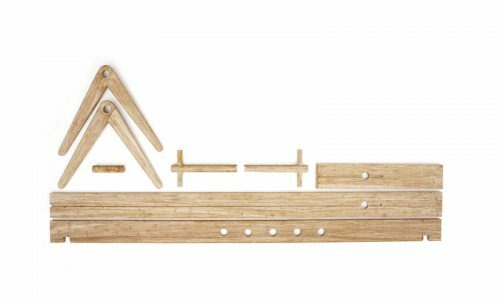 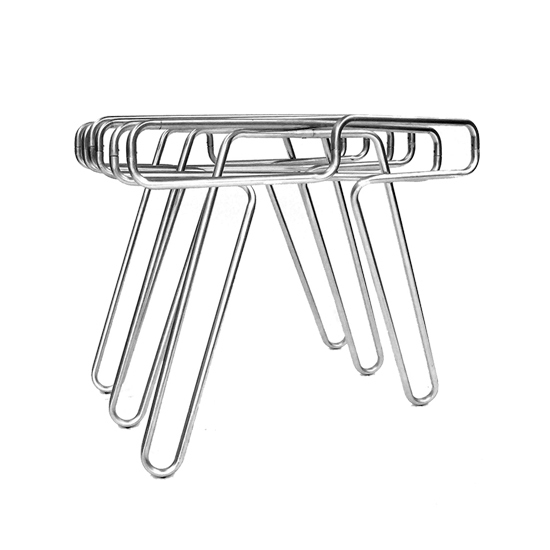 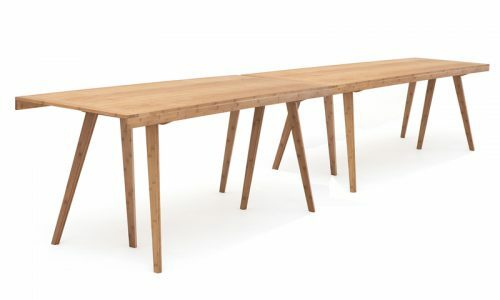 bench trestle is a tubular leg element, willing to hold any sort of plank that goes through it, without a need for further fastening (although there is an option to screw things together). 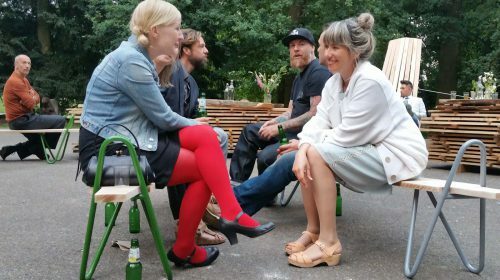 cascoland is an international collaborative project where artists and designers engage themselves in communities in order to activate and develop public space. 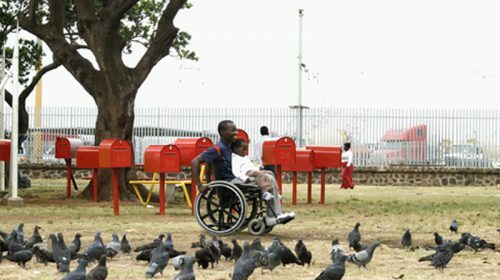 In 2008 Cascoland took place in the city of Durban, SA. 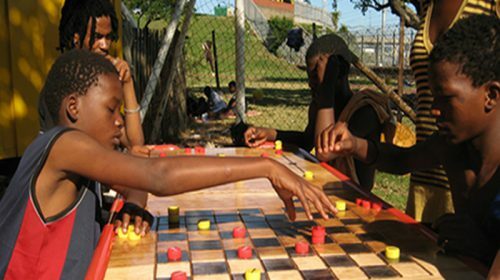 Umthombo drop-in centre for street children was the location Gitte Nygaard and myself chose to work in as part of Cascoland Durban. 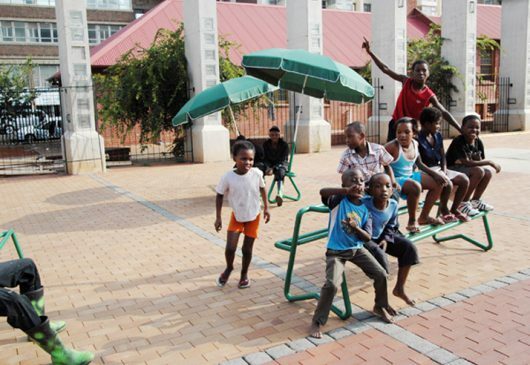 There are around 3000 street kids in Durban, and Umthombo is one of the organizations working for the children. 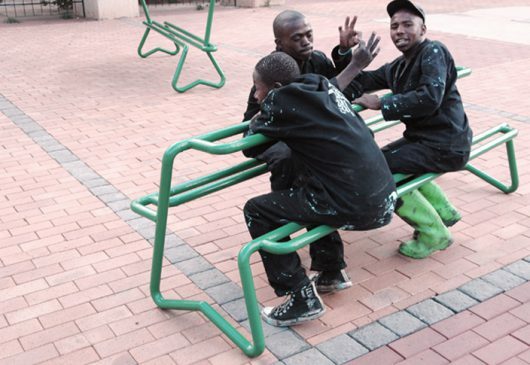 Umthombo’s work mainly focuses on ‘after care’ (bringing children back to their families) and a ‘back to school program’. 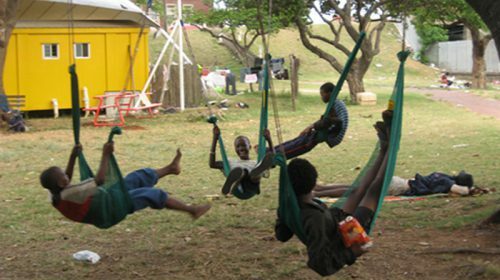 Each day approximately seventy children come to the drop-in centre. 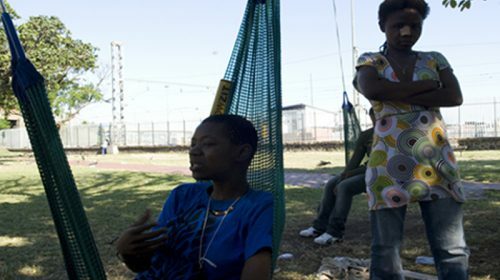 They get simple food three times a day, but are not allowed to sleep there and have no storage space for their(very few)personal belongings. 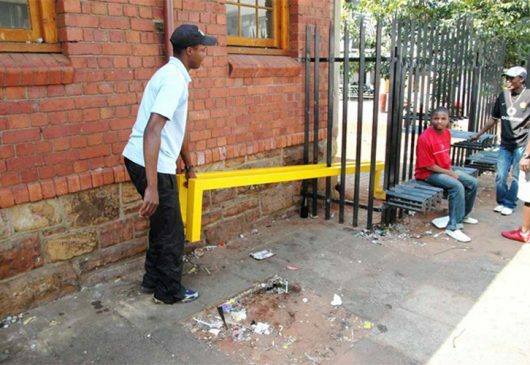 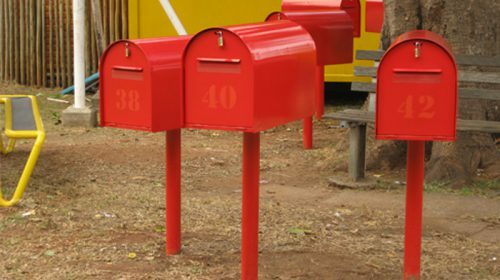 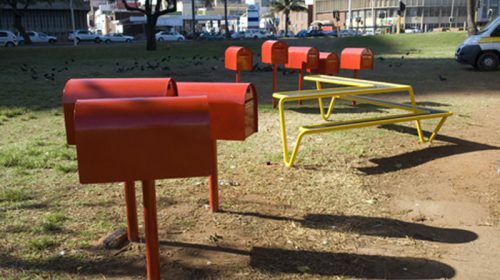 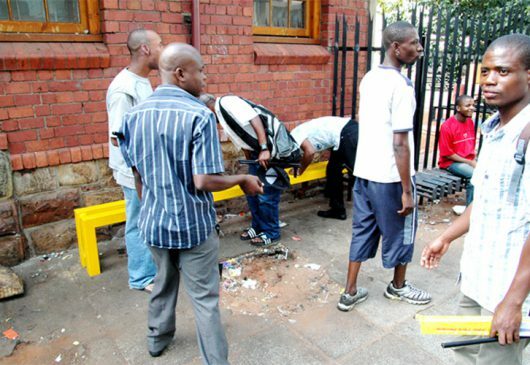 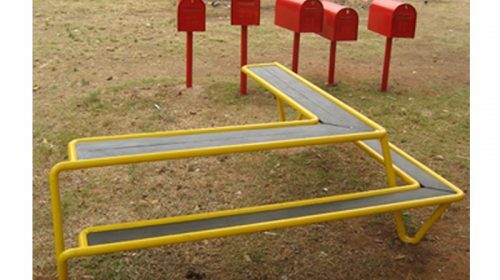 Our intention with the postbox-lockers was both to come up with a practical solution and provide the kids with a space of their own, tiny as it might be, and at the same time use the postboxes as a sign to announce the issue of street children to the people of Durban. 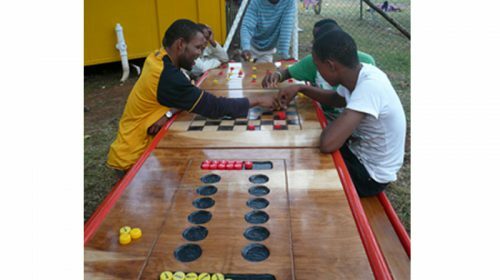 Other projects around the centre were YelloL, a horizontal blackboard table, Red Game-table with three different games engraved on it’s surface, and HowZit, sitting-hammocks/swings. 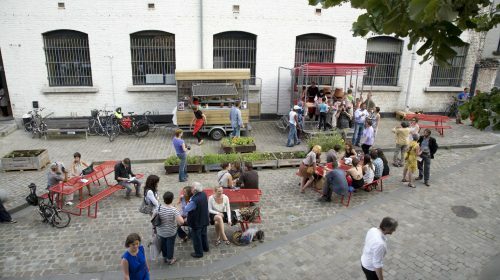 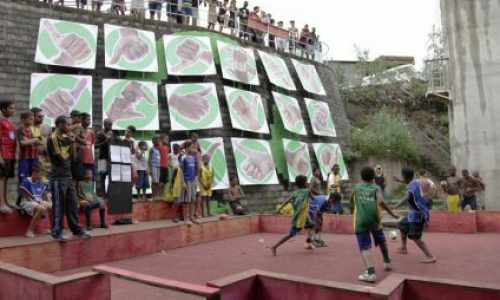 the project has been nominated for the Rotterdam Designprijs 2009.
cascoland is an international collaborative project where artists and designers engage themselves in communities in order to activate and develop public space.In 2007 cascoland took place at the Drill Hall, inner city Johannesburg, SA. 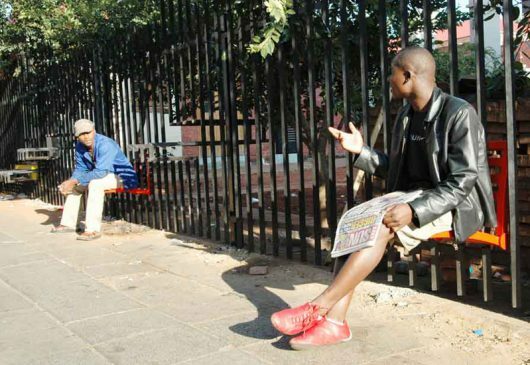 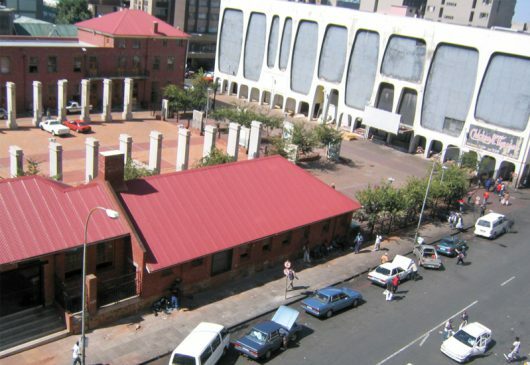 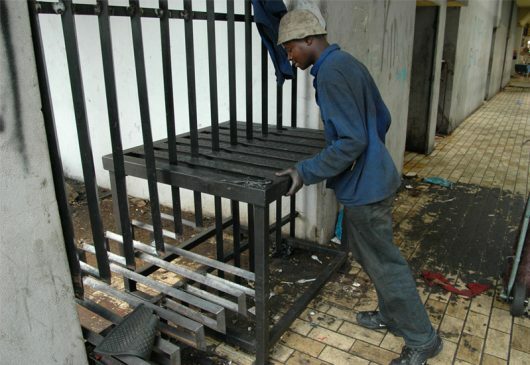 Besides its historical importance (the treason trials took place there in the 50’ and 60’), the Drill Hall, and the Hillbrow / Jubert park area, have gone over the past decade a dramatic physical and social transformation. 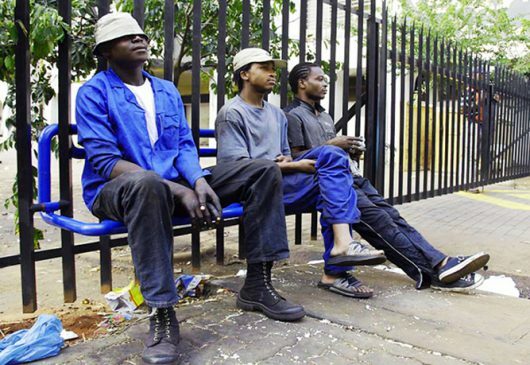 It has become the home to immigrants from all over Africa, thousands of people in search of a roof over their head and a job in the city. 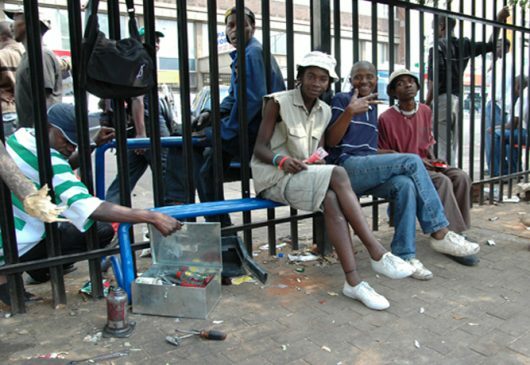 With exceptionally high densities of housing and revolving demography, inner-city lacks however basic public facilities of an urban environment of this size and intensity.The sidewalks surrounding the Drill Hall are home for numerous small businesses providing services for the hundreds of mini-van taxis around: car washers, mechanics, electricians, car-stereo technicians, snacks and cigarettes vendors, and so on. 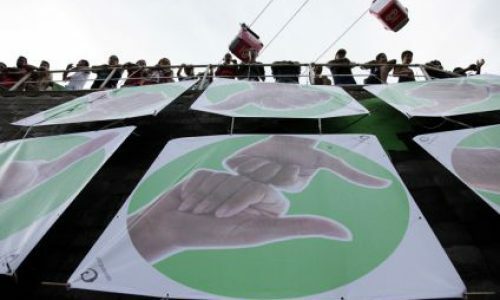 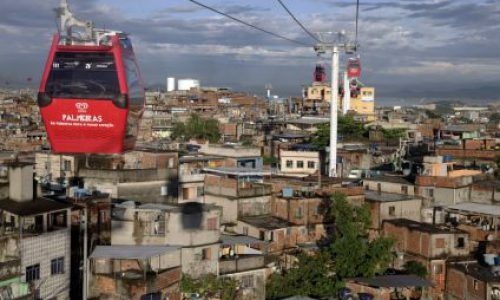 This micro-economy is well organized, creating jobs for many and providing quick and efficient service, but is not approved by the city authorities. 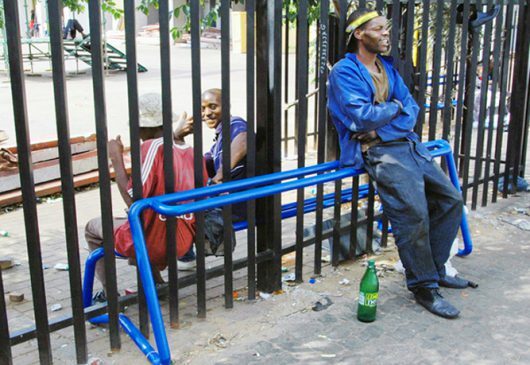 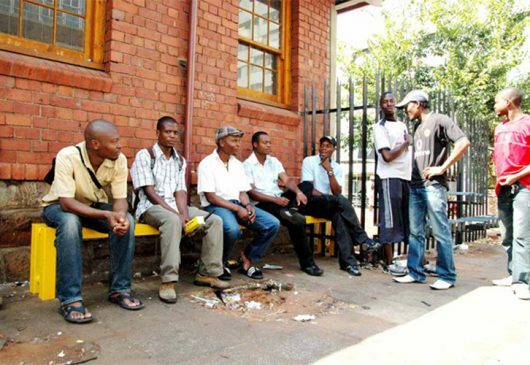 The need for seating facilities is obvious, both for the workers and for the public waiting for the taxis, which is the only mean of transport to and from the townships. 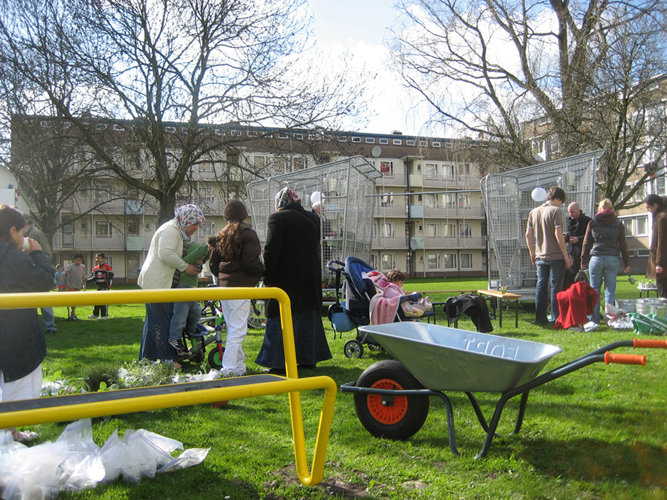 The goal of the project was to try and activate this public space which stood fenced and isolated, and my intention was to use the fence, the physical barrier between the compound and the outside world, as an infrastructure for a dialogue. 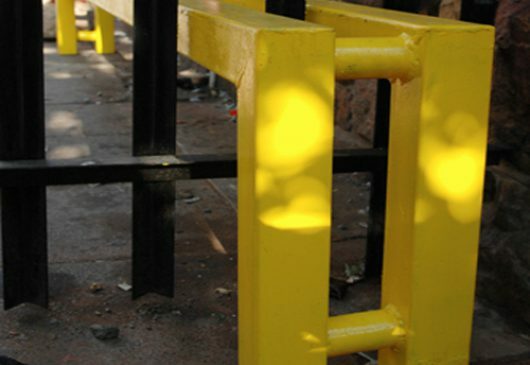 The fence, which normally defines the border between inside and outside, legality and illegality, mine and yours- is used to diffuse those definitions. 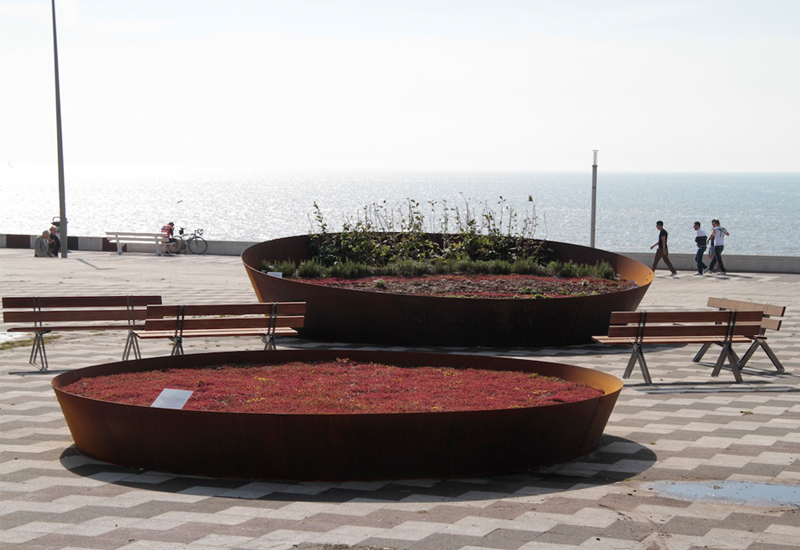 The Palco Público is a multi-purpose public space created on a vacant, littered in-between space opposite of Barraco #55. 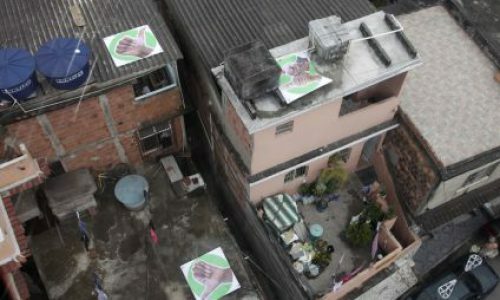 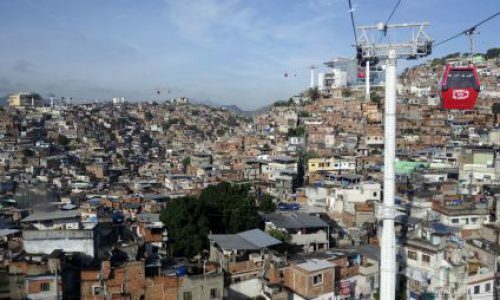 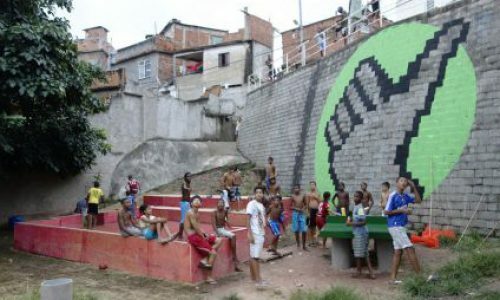 Now it is cleaned up, it is off the road, so it is safe for children and has a splendid view over the whole of Rio. 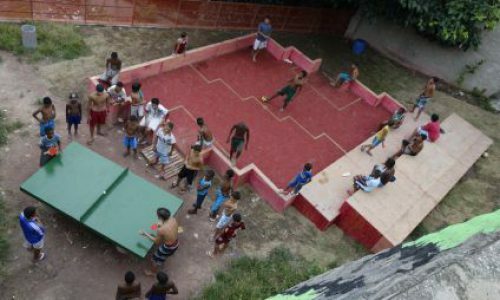 It’s design is open for various uses, it holds a ping pong table and a football pitch that is at the same time a Palco Público, a public stage for performances. 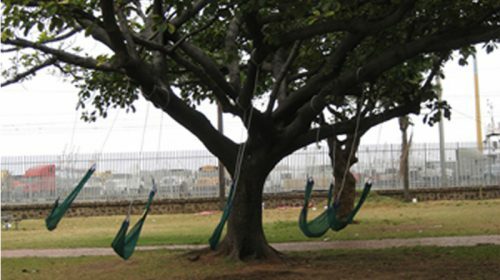 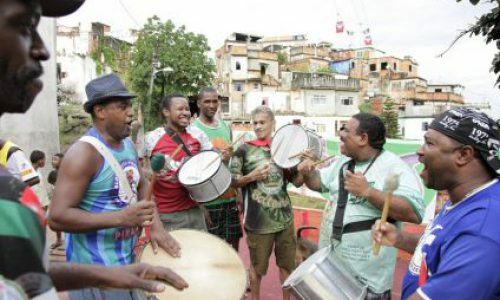 It is situated right under the Comuniférico and visible from afar. 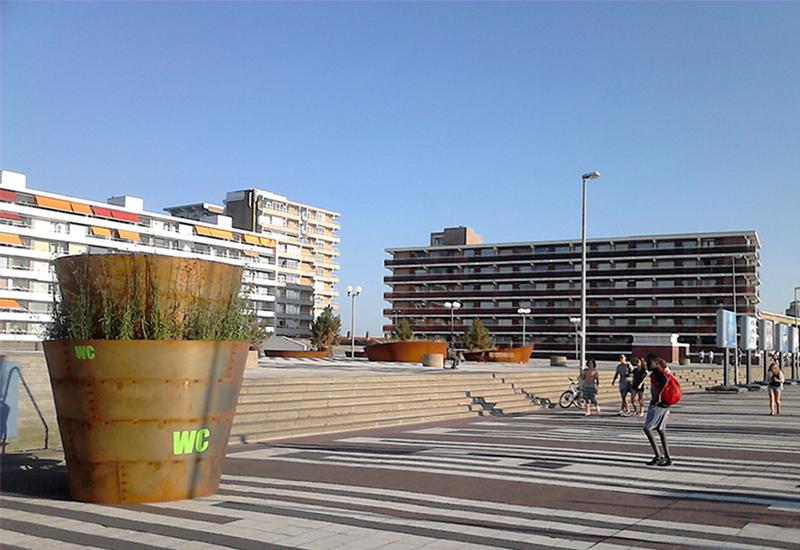 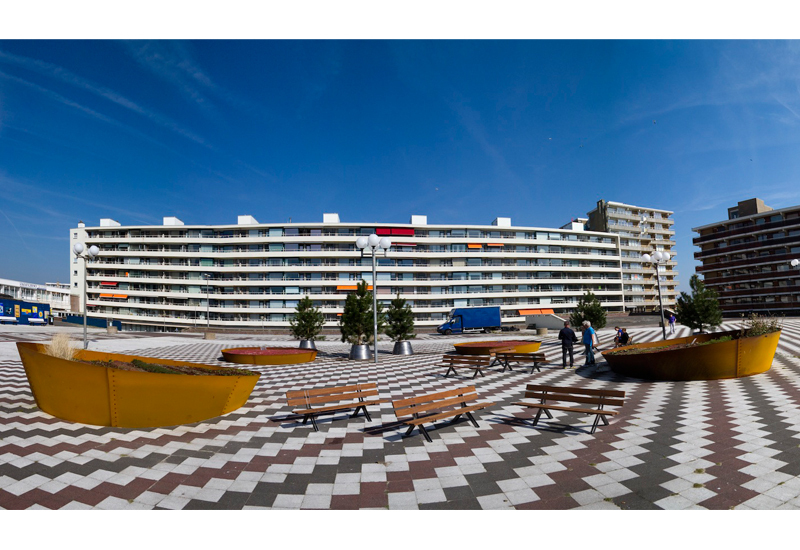 a cascoland project in collaboration with pakhuis de zwijger. 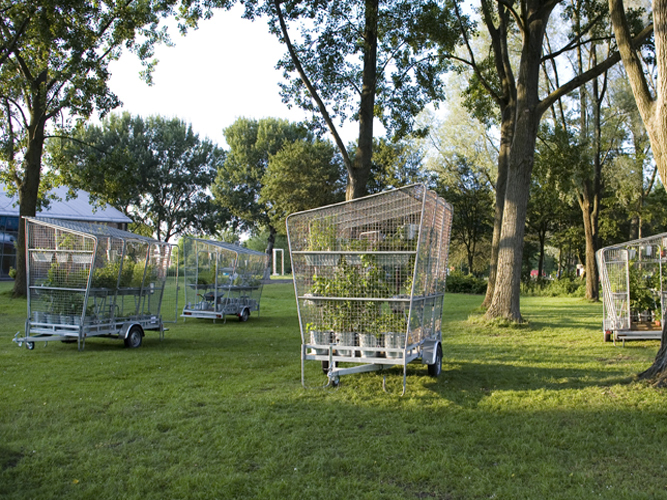 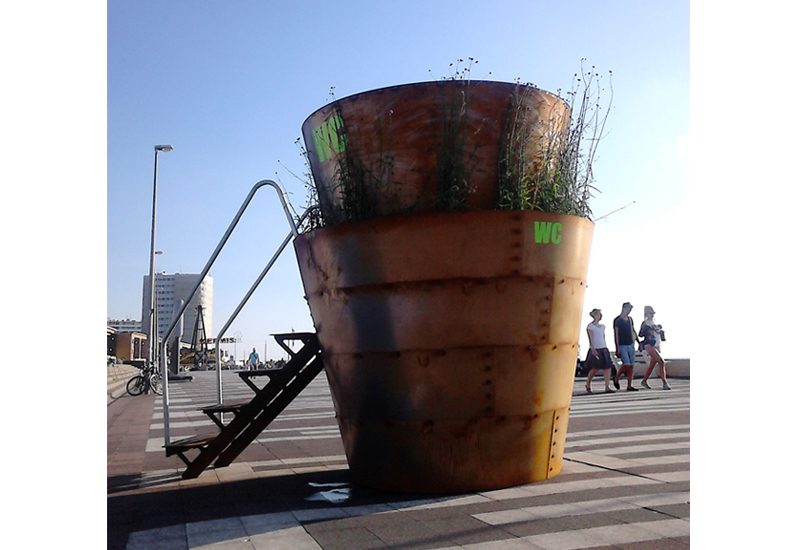 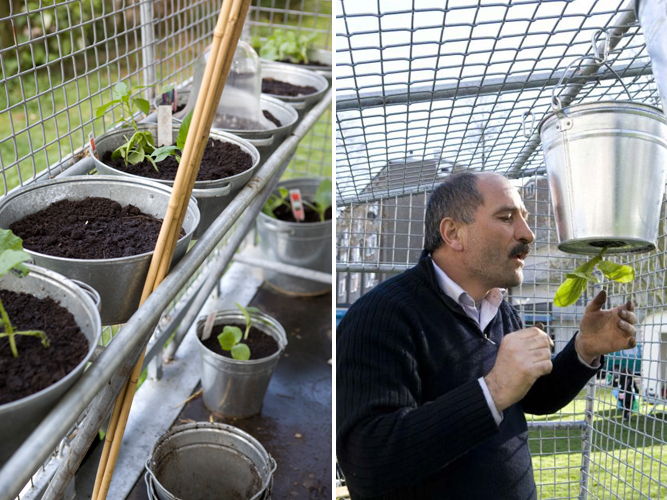 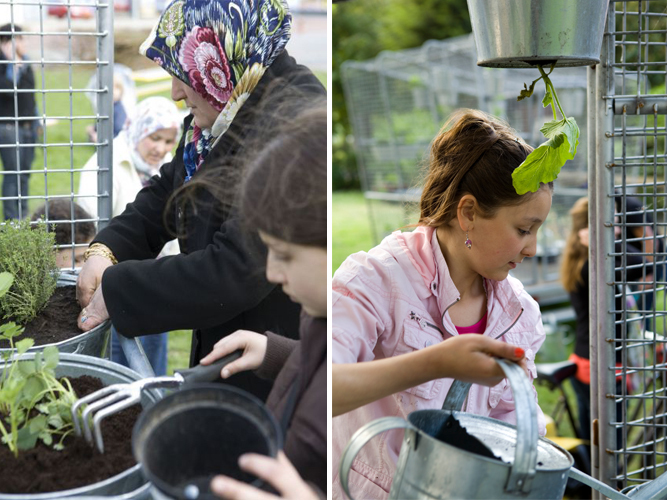 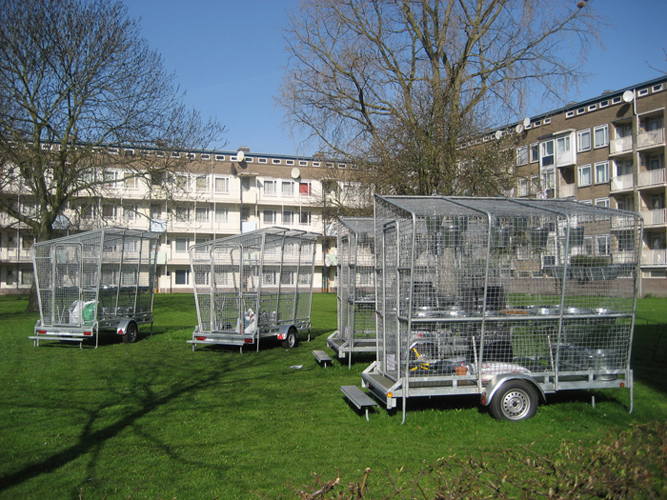 mobile gardens project, a collaboration with fiona de bell and the neighbours in geuzenveld, amsterdam new est. 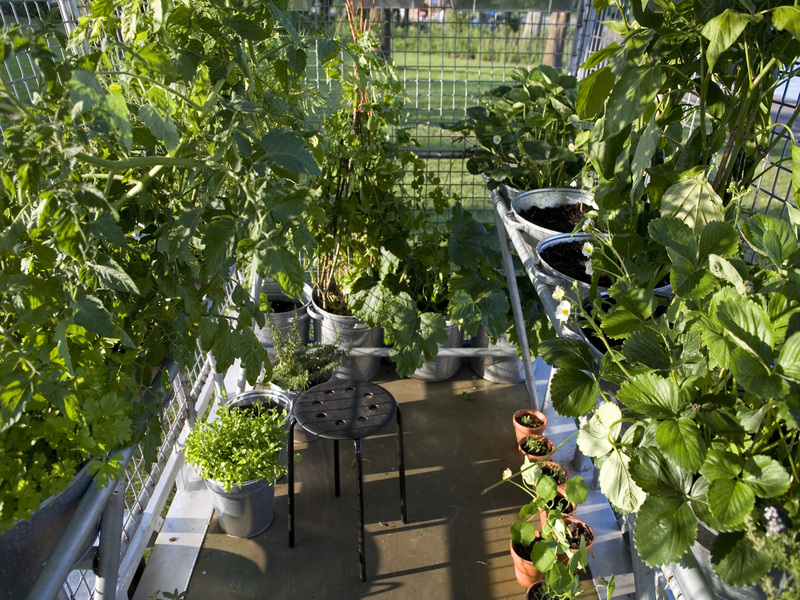 The idea was simple, to provide the option for apartment dwellers to grow their own vegetables for a season, a mobile allotment coming to your neighborhood. 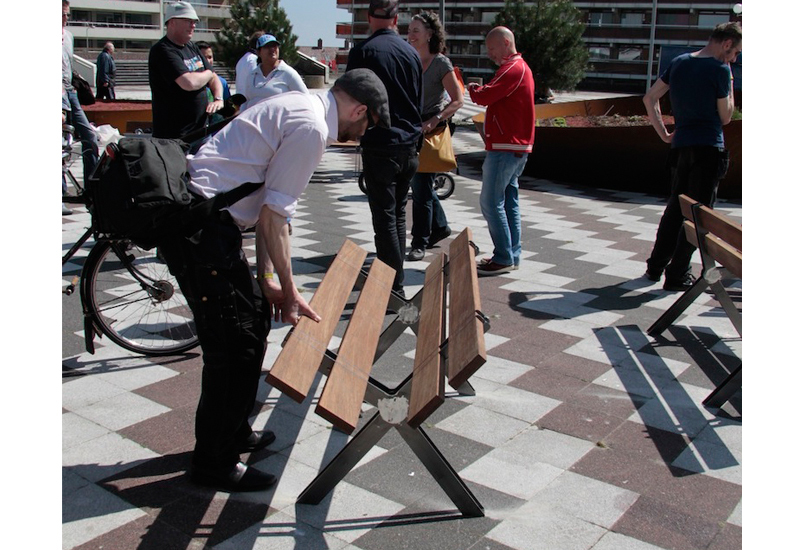 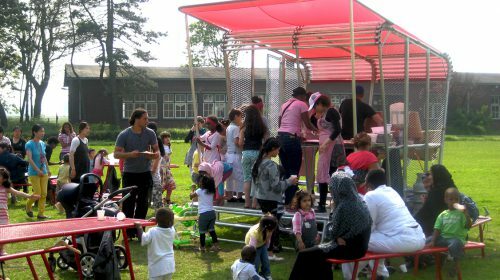 the underlying intention was to create a meeting point where neighbors can come together, and of course to activate the public space in another way. 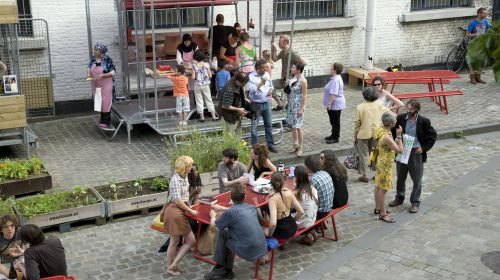 The gardens were placed in geuzenveld for the spring/summer of 2010, a second season the following year in the kolenkitbuurt and a third edition took place in molenbeek brussels in 2012. nowadays it’s on a prolonged residency at pakhuis de zwijger, amsterdam. 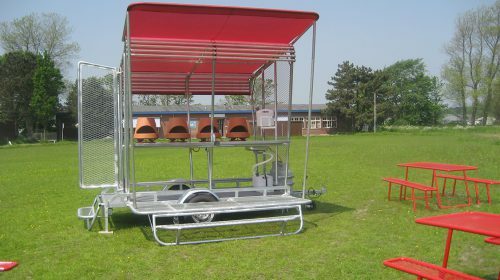 a mobile kitchen/restaurant. 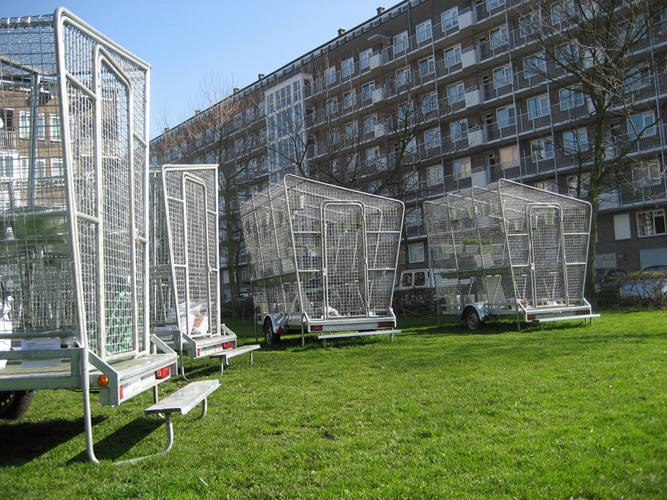 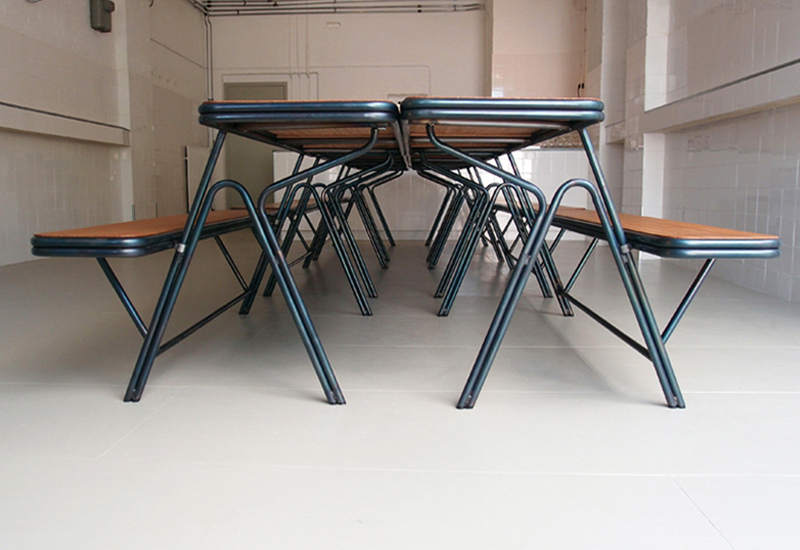 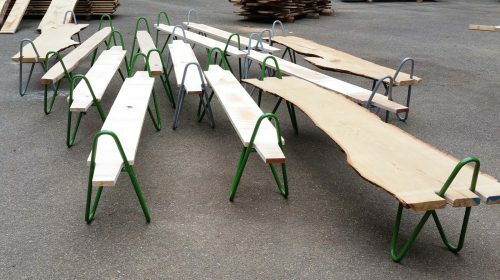 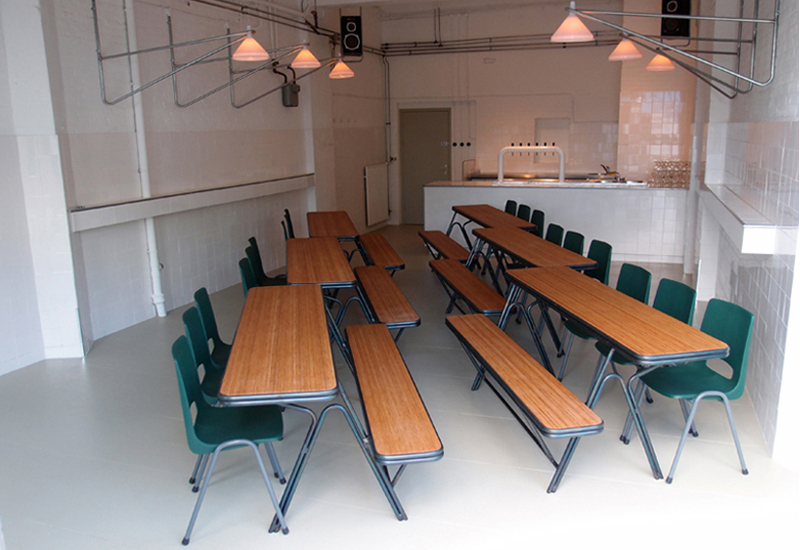 a construction mounted on a trailer with itegrated tables and benches to provide seating for 32 people. 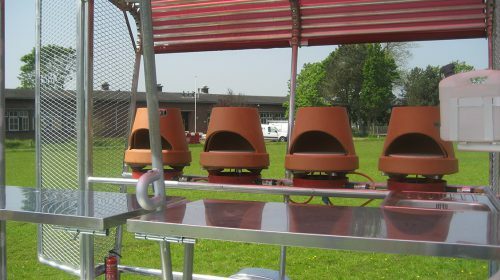 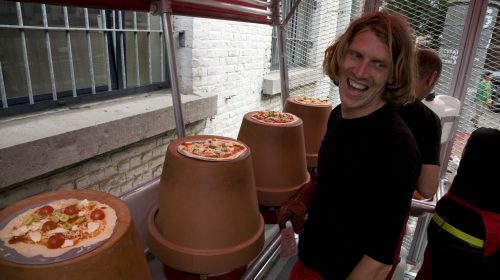 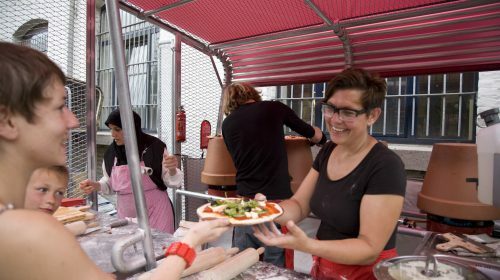 the ovens are made out of flower pots that are able to bake bread, flatbread and pizza within minutes. 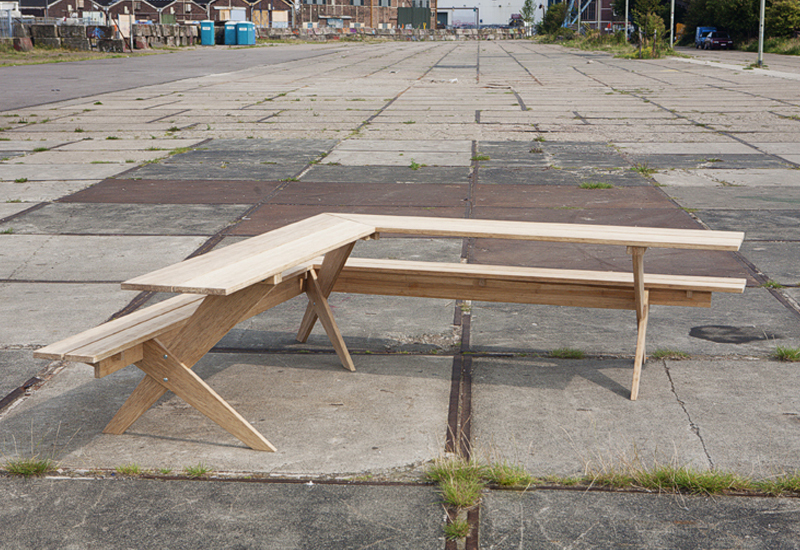 in collaboration with cascoland and wouter nieuwendijk. 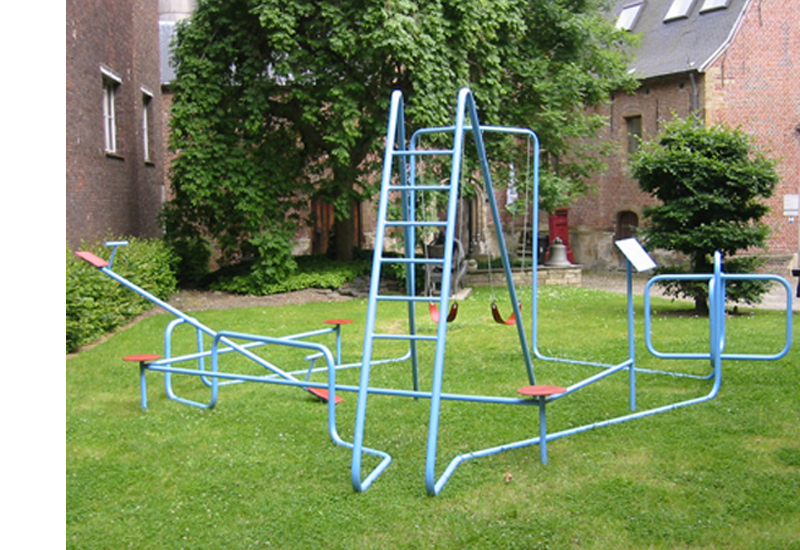 Using innocent and familiar icons, playground elements, we contributed slight modifications: the swings are on colliding tracks, the see-saw is off centre, the slide is lacking something. 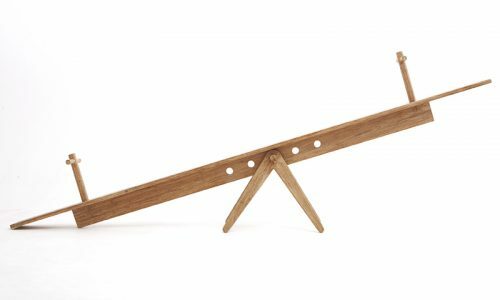 Most human initiated intended actions are aiming at some sort of benefit.